Maastricht (Maestricht, Mastricke, Mastreght), in Germany, i. 231, 492, 545, 644, 693; ii. 234, 244, 284, 527, 636 (2 ? "Trey"). Mabcalcey, Linc., i. g. 623 (p. 324). 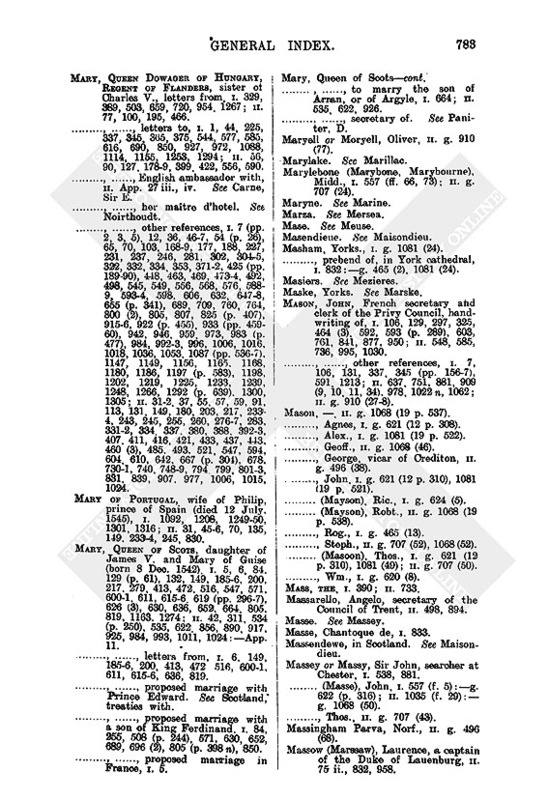 McCarthies (McCharties), the Irish family, i. 653. McCarthy Reagh (McChartie Reagh), Irish chief, son of Lady Eleanor Fitzgerald, i. 665. McConnell, Donald, lord of the Isles, q.v. Macdonald, Alex. Rannaldson, of Glengarry, i. 1298; ii. 42. -, Angus Maconill, i. 1298; ii. 42. -, Angus Rannaldson, of Knoydart, i. 1298; ii. 42. -, Archibald Maconill, Captain of Clanhustoun or Clanhounston, i. 1298; ii. 42. -, Donald MacConell, lord of the Isles, q.v. -, James Maconill, i. 1298; ii. 42. -, John McAllister, of Moydart, captain of Clanrannald, i. 1298; ii. 42, 294, 330. -, Rory MacAllister, dean of Morvern, bp. elect of the Isles; i. 1298; ii. 401, 120, 1967, 231, 268, 291, 294-5, 304, 3067, 324, 357. -, -, signature of, ii. 295. Macer, John, i. g. 1335 (12 p. 659). 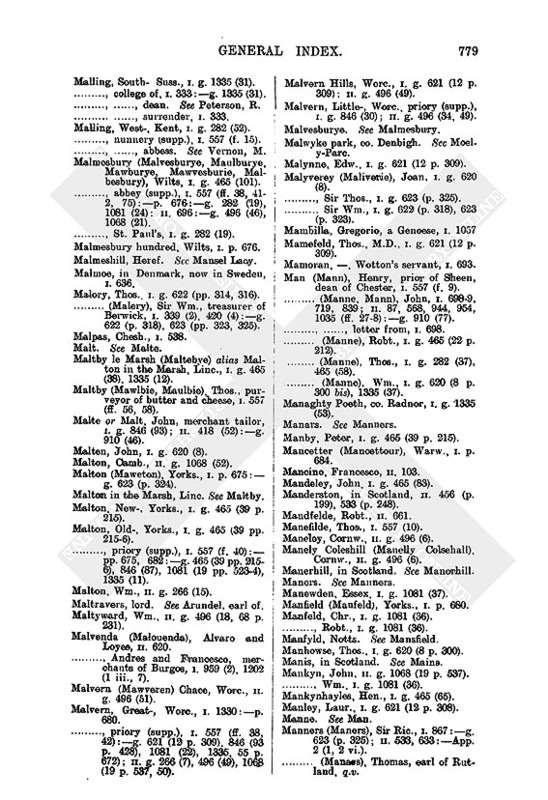 Macfarlane (Mackfarlan), Walter, of Ardlys, a Scot, i. 865, 1298; ii. 42. MacGill (Makgill, McGhil), , a Scot, ii. 308, 584. McGillevray, Archibald, vicar of Killean, i. 1298. Machant, Wm., i. g. 624 (15). Machell, Giles, ii. g. 707 (3). Machyn, John, i. p. 682. Machynlleth (Mahantleth, Mahancleth), co. Montgomery, ii. g. 266 (20, 36). Maclan (Mackeyn), Alex., of Ardnamurchan, i, 1298; ii. 42. 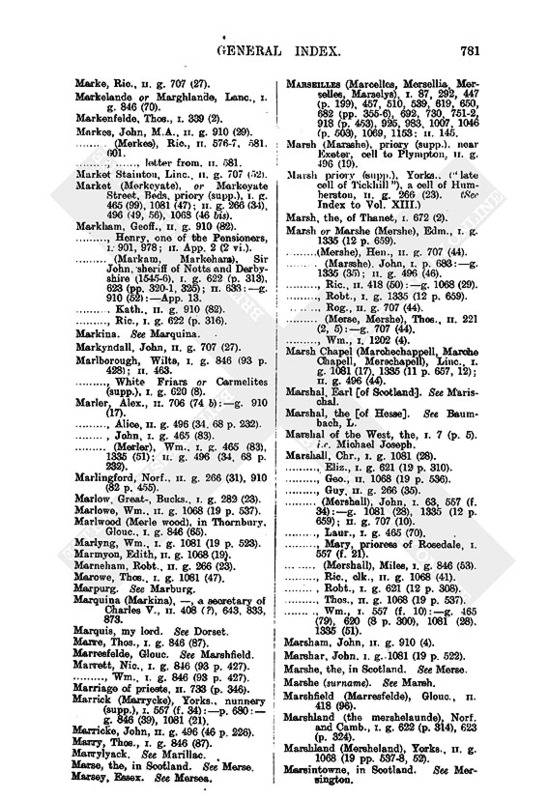 Mackerell or Makerell, Matth., abbot of Barlings (executed in 1537), i. g. 620 (49). -, Ric., ii. g. 707 (50). -, Thos., i. g. 1335 (12 p. 659). -, Widow, i. g. 1081 (19 p. 523). 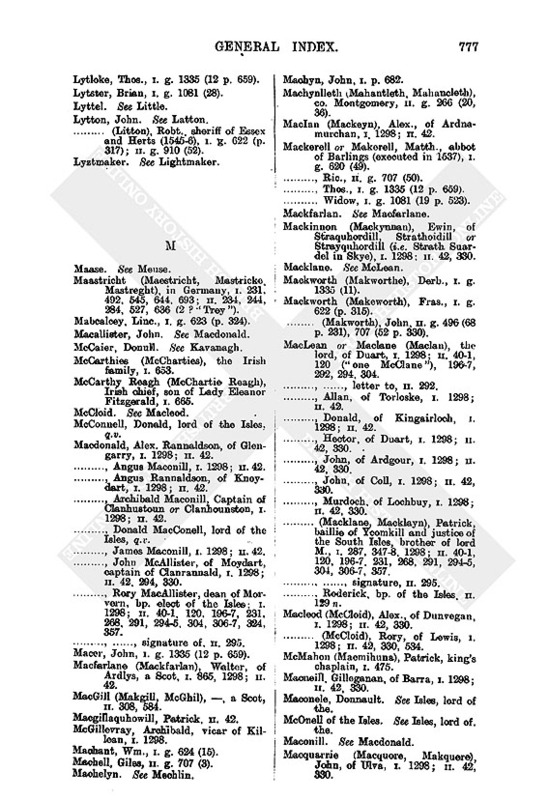 Mackinnon (Mackynnan), Ewin, of Straquhordill, Strathoidill or Strayquhordill (i.e. Strath Suardel in Skye), i. 1298; ii. 42, 330. Mackworth (Makeworth), Fras., i. g. 622 (p. 315). -, (Makworth), John, ii. g. 496 (68 p. 231), 707 (52 p. 330). MacLean or Maclane (Maclan), the lord, of Duart, i. 1298; ii. 401, 120 ("one McClane"), 1967, 292, 294, 304. -, -, letter to, ii. 292. -, Allan, of Torloske, i. 1298; ii. 42. -, Donald, of Kingairloch, i. 1298; ii. 42. -, Hector, of Duart, i. 1298; ii. 42, 330. -, John, of Ardgour, i. 1298; ii. 42, 330. -, John, of Coll, i. 1298; ii. 42, 330. -, Murdoch, of Lochbuy, i. 1298; ii. 42, 330. 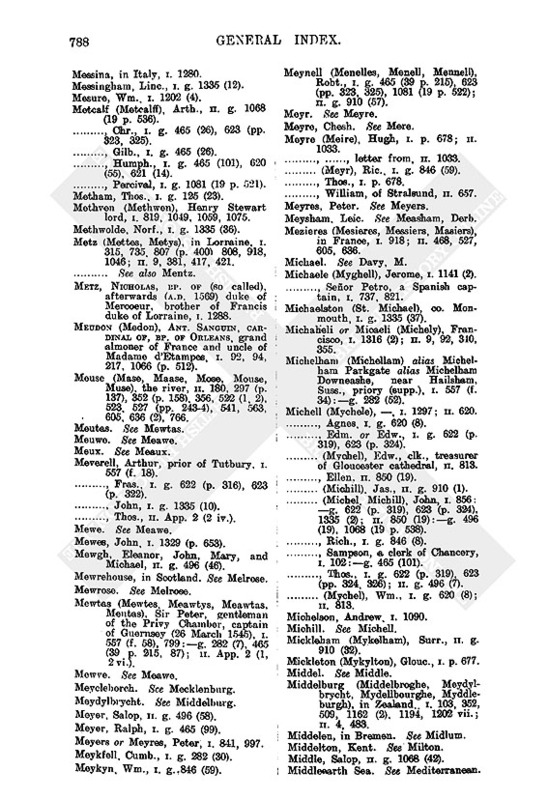 -, (Macklane, Macklayn), Patrick, baillie of Ycomkill and justice of the South Isles, brother of lord M., i. 287, 3478, 1298; ii. 401, 120, 1967. 231, 268, 291, 2945, 304, 3067, 357. -, -, signature, ii. 295. -, Roderick, bp. of the Isles ii. 129 n.
Macleod (McCloid), Alex., of Dunvegan, i. 1298; ii. 42, 330. -, (McCloid), Rory, of Lewis, i. 1298; ii. 42, 330, 534. McMahon (Macmihuna), Patrick, king's chaplain, i. 475. Macneill, Gilleganan, of Barra, i. 1298; ii. 42, 330. Maconele, Donnault. See Isles, lord of the. McOnell of the Isles. See Isles, lord of. the. Macquarrie (Macquore, Makquere), John, of Ulva, i. 1298; ii. 42, 330. Mauelo (Mocuelo, Macuello, Macuelleo), Antonio, i. 856, 1019 ii. 134, 344, 387, 620, 674, 682, 720. Macy, Wm., i. g. 465 (21). Madeley (Mawdeley), Staff., ii. g. 496 (42). Madok, Glm., ii. g. 910 (13). Madox, Hen., i. g. 622 (p. 315). -, (Madockes), Humph., i. g. 846 (59). 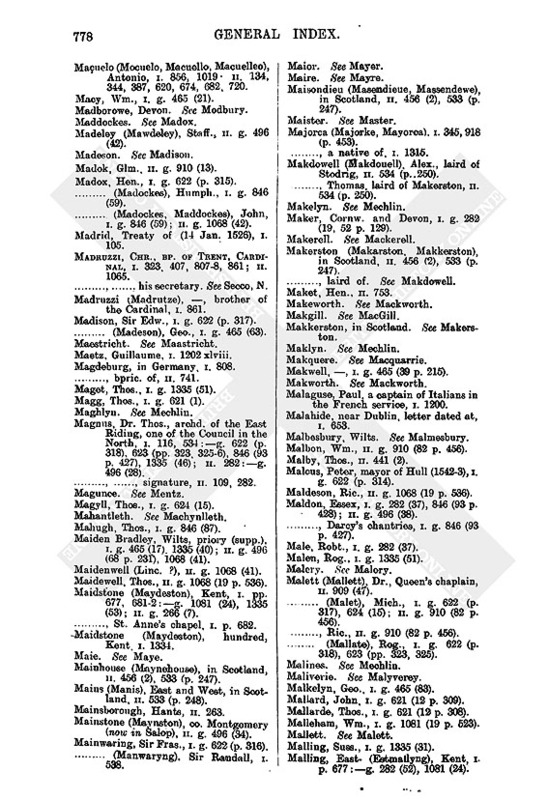 -, (Madockes, Maddockes), John, i. g. 846 (59); ii. g. 1068 (42). Madrid, Treaty of (14 Jan. 1526), i. 105. Madruzzi, Chr., bp. of Trent, Cardinal, i. 323. 407, 8078, 861; ii. 1065. -, -, his secretary. See Secco, N.
Madruzzi (Madrutze), , brother of the Cardinal, i. 861. Madison, Sir Edw., i. g. 622 (p. 317). -, (Madeson), Geo., i. g. 465 (63). Maetz, Guillaume, i. 1202 xlviii. Magdeburg, in Germany, i. 808. -, bpric. of, ii. 741. Maget, Thos., i. g. 1335 (51). Magg, Thos., i. g. 621 (1). Magnus, Dr. Thos., archd. of the East Riding, one of the Council in the North, i. 116, 534:g. 622 (p. 318), 623 (pp. 323 3256), 846 (93 p. 427), 1335 (46); ii. 282:g. 496 (28). -, -, signature, ii. 109, 282. Magyll, Thos., i. g. 624 (15). Mahugh, Thos., i. g. 846 (87). Maiden Bradley, Wilts, priory (supp. ), i. g. 465 (17), 1335 (40); ii. g. 496 (68 p. 231), 1068 (41). Maidenwell (Linc. ? ), ii. g. 1068 (41). Maidewell, Thos., ii. g. 1068 (19 p. 536). Maidstone (Maydeston), Kent, i. pp. 677, 6812:g. 1081 (24), 1335 (53); ii. g. 266 (7). -, St. Anne's chapel, i. p. 682. Maidstone (Maydeston), hundred, Kent. i. 1334. Mainhouse (Maynehouse), in Scotland, ii. 456 (2), 533 (p. 247). Mains (Manis), East and West, in Scotland, ii. 533 (p. 248). Mainstone (Maynston), co. Montgomery (now in Salop), ii. g. 496 (34). Mainwaring, Sir Fras., i. g. 622 (p. 316). -, (Manwaryng). Sir Randall, i. 538. Maisondieu (Masendieue, Massendewe), in Scotland, ii. 456 (2), 533 (p. 247). Majorca (Majorke, Mayorca), i. 345, 918 (p. 453). -, a native of, i. 1315. Makdowell (Makdouell) Alex., laird of Stodrig, ii. 534 (p.. 250). -, Thomas laird of Makerston, ii. 534 (p. 250). Maker, Cornw. and Devon, i. g. 282 (19, 52 p. 129). Makerston (Makarston, Makkerston), in Scotland, ii. 456 (2), 533 (p. 247). -, laird of. See Makdowell. Makkerston, in Scotland. See Makerston. Makwell, , i. g. 465 (39 p. 215). Malaguse, Paul, a captain of Italians in the French service, i. 1200. Malahide, near Dublin, letter dated at, i. 653. Malbon, Wm., ii. g. 910 (82 p. 456). Malby, Thos., ii. 441 (2). Malcus, Peter, mayor of Hull (15423), i. g. 622 (p. 314). Maldeson, Ric., ii. g. 1068 (19 p. 536). Maldon, Essex, i. g. 282 (37), 846 (93 p. 428); ii. g. 496 (38). -, Darcy's chantries, i. g. 846 (93 p. 427). Male, Robt., i. g. 282 (37). Malen, Rog., i. g. 1335 (51). Malett (Mallett), Dr., Queen's chaplain, ii. 909 (47). -, (Malet), Mich., i. g. 622 (p. 317), 624 (15); ii. g. 910 (82 p. 456). -, Ric., ii. g. 910 (82 p. 456). -, (Mallate), Rog., i. g. 622 (p. 318), 623 (pp. 323, 325). Malkelyn, Geo., i. g. 465 (83). Mallard, John, i. g. 621 (12 p. 309). Mallarde, Thos., i. g. 621 (12 p. 308). Malleham, Wm., i. g. 1081 (19 p. 523). Mailing, Suss., i. g. 1335 (31). Mailing, East- (Estmallyng), Kent, i. p. 677:g. 282 (52), 1081 (24). Malling, South- Suss., i. g. 1335 (31). -, college of, i. 333:g. 1335 (31). -, -, dean. See Peterson, R.
-, -, surrender, i. 333. Malling, West-, Kent, i. g. 282 (52). -, nunnery (supp. ), i. 557 (f. 15). -, -, abbess. See Vernon, M.
Malmesbury (Malvesburye, Maulburye, Mawburye, Mawvesburie, Malbesbury), Wilts, i. g. 465 (101). -, abbey (supp. ), i. 557 (ff. 38, 412, 75):p. 676:g. 282 (19), 1081 (24): ii. 696:g. 496 (46), 1068 (21). -, St. Paul's, i. g. 282 (19). Malmesbury hundred, Wilts, i. p. 676. Malmeshill, Heref. See Mansel Lacy. Malmoe, in Denmark, now in Sweden, i. 636. Malory, Thos., i. g. 622 (pp. 314, 316). -, (Malery), Sir Wm., treasurer of Berwick, i. 339 (2), 420 (4):g. 622 (p. 318), 623 (pp. 323, 325). Maltby le Marsh (Maltebye) alias Malton in the Marsh. Linc., i. g. 465 (38), 1335 (12). Maltby (Mawlbie, Maulbie). Thos., purveyor of butter and cheese, i. 557 (ff. 56, 58). Malte or Malt, John, merchant tailor, i. g. 846 (93); ii. 418 (52):g. 910 (46). Malten, John, i. g. 620 (8). Malton, Camb., ii. g. 1068 (52). Malton (Maweton), Yorks., i. p. 675:g. 623 (p. 324). Malton in the Marsh, Linc. See Maltby. Malton, New-, Yorks., i. g. 465 (39 p. 215). Malton, Old-, Yorks., i. g. 465 (39 pp. 2156). -, priory (supp. ), i. 557 (f. 40):pp. 675, 682:g. 465 (39 pp. 2156), 846 (87), 1081 (19 pp. 5234), 1335 (11). Malton, Wm., ii. g. 266 (15). Maltravers, lord. See Arundel, earl of. Maltyward, Wm., ii. g. 406 (18, 68 p. 231). Malvenda (Malouenda), Alvaro and Loyes, ii. 620. -, Andres and Francesco, merchants of Burgos, i. 959 (2) 1202 (1 iii., 7). Malvern (Mawveren) Chace, Worc., ii. g. 496 (51). Malvern, Great-, Worc., i. 1330:p. 680. -, priory (supp. ), i. 557 (ff. 38, 42):g. 621 (12 p. 309), 846 (93 p. 428), 1081 (22), 1335, 55 p. 672); ii. g. 266 (7), 496 (49), 1068 (19 p. 537, 50). Malvern, Hills, Worc., i. g. 621 (12 p. 309); ii. g. 496 (49). Malvern, Little-, Worc., priory (supp. ), i. g. 846 (30); ii. g. 496 (34, 49). Malwyke park, co. Denbigh. See Moely-Parc. Malynne, Edw., i. g. 621 (12 p. 309). Malyverey (Maliverie), Joan, i. g. 620 (8). -, Sir Thos., i. g. 623 (p. 325). -, Sir Wm., i. g. 622 (p. 318), 623 (p. 323). Mamefeld, Thos., M.D., i. g. 621 (12 p. 309). Mamoran, , Wotton's servant, i. 693. Man (Mann), Henry, prior of Sheen, dean of Chester, i. 557 (f. 9). -, (Manne, Mann), John, i. 6989, 719, 839; ii. 87, 568, 944, 954, 1035 (ff. 278):g. 910 (77). -, -, letter from, i. 698. -, (Manne), Robt., i. g. 465 (22 p. 212). -, (Manne), Thos., i. g. 282 (37), 465 (58). -, (Manne), Wm., i. g. 620 (8 p. 300 bis), 1335 (37). Managhty Poeth, co. Radnor, i. g. 1335 (53). Manby, Peter, i. g. 466 (39 p. 215). Mancetter (Mancettour), Warw., i. p. 684. Mandeley, John. i. g. 465 (83). Manderston, in Scotland, ii. 466 (p. 199), 533 (p. 248). Manefilde, Thos., i. 557 (10). Maneley, Cornw., ii. g. 496 (6). Manely Coleshill (Manelly Colsehall), Cornw., ii. g. 496 (6). Manerhill, in Scotland. See Manorhill. Manewden, Essex, i. g. 1081 (37). Manfield (Manfeld), Yorks., i. p. 680. Manfeld, Chr., i. g. 1081 (36). -, Robt., i. g. 1081 (36). Manhowse, Thos., i. g. 620 (8 p. 300). Manis, in Scotland. See Mains. Mankyn, John, ii. g. 1068 (19 p. 537). -, Wm., i. g. 1081 (36). Mankynhayles, Hen., i. g. 466 (65). Manley, Laur., i. g. 621 (12 p. 308). Manners (Maners), Sir Ric., i. 867:g. 623 (p. 325); ii. 533, 633:App. 2 (1, 2 vi.). -, (Manars), Thomas, earl of Rutland, q.v. Manning, Eliz., i. g. 846 (47). -, John. King's joiner, ii. 706 (50):g. 707 (41). Manorhill (Manerhill), in Scotland, ii. 456 (2), 533 (p. 247). Mansel Lacy (Malmeshill), Heref., ii. g. 910 (33). Manser, Geo., i. p. 675. -, Nic., i. g. 282 (37). Mansfeld (Mantzfeld), count of, i. 861. Mansfield (Manfyld), Notts, i. 1030. Mansfilde, John, i. 557 (f. 26). Mantell (Mantel), John, attainted, i. p. 675. -, -,Sir Walter, i. g. 1335 (21). -, Walter, i. g. 1335 (21). Manthorpe, Linc., i. g. 465 (38), 1335 (11 p. 657, 12 p. 659). Manton (Maunton), Linc., i. g. 1335 (28). Manton, Rutl., i. g. 465 (38), 846 (45). Mantoncrake, in Scotland. See Minto Crag. Mantua, 192, 602, 650 (2). -, letter dated at, i. 948. Mantua, Frederic Gonzaga. duke of, i. 292, 315. Mantua, Matthew de, ii. 1035 (f. 17). Manwarre, in Scotland. See Ninewar. Mapelton, Wm., ii. g. 707 (50). Mapperley or Maperley, James, ii. 418 16, 17), 1035 (f. 19). Maplestead, Essex, i. g. 125 (2). Maplested, Wm., i. g. 125 (2). Mapleton, Ric., i. g. 621 (12 p. 309). Mapull, Maurice, i. 1329 (2). Marble, for house building, i. 542. Marbottell, in Scotland. See Morbattle. Marburg (Marpurg), in Hesse, i. 390 n.
Marbury, Thos., i. 1202 (4). March, earldom of, i. g. 1335 (49); ii. g. 910 (30, 33). March, the, in Scotland. See Merse. Marchant. John, i. g. 282 (19). Marchcleugh (Merche Cleughe), in Scotland, ii. 456 (2), 533 (p. 247). Marche, Wm., of Calais, i. 55, 836. Marche Chapell or Marchechappell, Linc. See Marsh Chapel. Marden, John, i. g. 465 (58). -, Marg., i. g. 620 (8 p. 300). Marderby, Yorks. g. 465 (39 p. 215). Mardreff, co. Carnarvon, ii. g. 910 (24). Marengo, Alisandro, an Italian captain, ii. 464. Mares, John, i. g. 125 (31). Marewood, Yorks. See Marwood, Dham. Marfelde, John, i. g. 1335 (36). Margam or Morgan abbey (supp. ), co. Glamorgan, i. 557 (f. 31):g. 1335 (37, 55 p. 673). Margaret of Angouleme, Queen of Navarre, sister of Francis i., i. 138, 334 342, 372, 398, 619 (pp. 2967); ii. 836, 9412, 984, 1006, 1011, 1024 (p. 509). -, -, letter from, ii. 942. -, -, letter to, ii. 943. Margaret of Austria, Charles V.'s natural daughter, duchess dowager of Florence, wife of Octavio Farnese duke of Camerino, i. 1288; ii. 19, 337, 379. -, -, gives birth to twins, ii. 337, 379. Margaret of France, daughter of Francis i., ii. 619, 1249, 1288; ii. 408, 519, 567, 740, 758, 794, 802, 805, 837, 839, 856, 860, 872, 875, 1038, 1048. Margaretting (Margetyng), Essex, ii. g. 707 (9). Margate (Marget), Kent, i. 240, 672 (2); ii. 795. Margerye, John, i. g. 846 (87). Marghlande or Markelande, Lanc., i. g. 846 (70). Marguison (Morgison), or Marquise, in the Boulonnois, i. 1179. Mariano (Marian), Angelo, of Cremona, Italian captain retained by Henry VIII., i. 450, 552, 64950, 729, 745, 751 (1, 2), 7524:g. 620 (2); ii. 491, 704, 790, 866. -, -, list of his captains, i. 751 (2). Marillac (Marrylyack, Marylake), Charles, French ambassador to England (15391543) i. 807; ii. 245 (p. 108), 838. -, -, his cousin. See Formes, M. de. Marine or Marino, Hipolito, i. 1043, 1154. -, Simon de, Venetian, ii. 951. Marisohal (Marchell, Marshal, Merschell), William Keith earl, i. 210 (2), 477, 547, 763, 785, 857 (3), 1063, 1106 (2); ii. 144, 216, 308, 534. -, -, signature of. ii. 144. Marjoribanck, Thomas, copy certified by, i. 598. Markby (Markebye), Linc., priory (supp. ), i. g. 1336 (12, 53). Markby (Amarkby), John, ii. g. 707 (50). Marke, Ric., ii. g. 707 (27). Markelande or Marghlande, Lanc., i. g. 846 (70). Markenfelde, Thos., i. 339 (2). Markes, John, M.A., ii. g. 910 (29). -, (Merkes), Ric., ii. 5767, 581, 601. -, -, letter from, ii. 581. Market Staintou, Linc., ii. g. 707 (52). Market (Merkeyate), or Markeyate Street, Beds, priory (supp. ), i. g. 465 (99), 1081 (47); ii g. 266 (34), 496 (49, 56), 1068 (46 bis). Markham, Geoff., ii. g. 910 (82). -, Henry, one of the Pensioners, i. 901, 978; ii. App. 2 (2 vi.). -, (Markam, Markeham), Sir John, sheriff of Notts and Derbyshire (15456), i. g. 622 (p. 313), 623 (pp. 3201, 325); ii. 633:g. 910 (52):App. 13. -, Kath., ii. g. 910 (82). -, Ric., i. g. 622 (p. 316). Markyndall, John, ii. g. 707 (27). Marlborough, Wilts, i. g. 846 (93 p. 428); ii. 463. -, White Friars or Carmelites (supp. ), i. g. 620 (8). Marler, Alex., ii. 706 (74 b):g. 910 (17). -, Alice, ii. g. 496 (34. 68 p. 232). -, John, i. g. 465 (83). -, (Merler), Wm., i. g. 465 (83), 1335 (51); ii. g. 496 (34, 68 p. 232). Marlingford, Norf., ii. g. 266 (31), 910 (82 p. 455). Marlow. Great-, Bucks., i. g. 282 (23). Marlowe, Wm., ii. g. 1068 (19 p. 537). Marlwood (Merle wood), in Thornbury, Glouc., i. g. 846 (65). Marlyng, Wm., i. g. 1081 (19 p. 523). Marmyon, Edith, ii. g. 1068 (19). Marneham, Robt., ii. g. 266 (23). Marowe, Thos., i. g. 1081 (47). Marquina (Markina), , a secretary of Charles V., ii. 408 (? ), 643, 833, 873. Marquis, my lord. See Dorset. Marre, Thos., i. g. 846 (87). Marrett, Nic., i. g. 846 (93 p. 427). -, Wm., i. g. 846 (93 p. 427). Marriage of priests, ii. 733 (p. 346). Marrick (Marrycke), Yorks., nunnery (supp. ), i. 557 (f. 34):p. 680:g. 846 (39), 1081 (21). Marricke, John, ii. g. 406 (46 p. 226). Marry, Thos., i. g. 846 (87). Marse, the, in Scotland. See Merse. Marseilles (Marcelles, Mersellia, Merselles, Marselys), i. 87, 292, 447 (p. 199), 457, 510, 539, 619, 650, 682 (pp. 3556), 692, 730, 7512. 918 (p. 453), 925, 983, 1007, 1046 (p. 503), 1069, 1153: ii. 145. Marsh (Marsshe), priory (supp. ), near Exeter, cell to Plympton, ii. g. 496 (19). Marsh, the, of Thanet, i. 672 (2). Marsh or Marshe (Mershe), Edm., i. g. 1335 (12 p. 659). -, (Mershe), Hen., ii. g. 707 (44). -, (Marsshe). John, i. p. 683:g. 1335 (35); ii. g. 496 (46). -, Ric., ii. 418(50):g. 1068 (29). -, Robt., i. g. 1335 (12 p. 659). -, Rog., ii. g. 707 (44). -, (Merse, Mershe), Thos., ii. 221 (2, 5):g. 707 (44). -, Wm., i. 1202 (4). Marsh Chapel (Marchechappell, Marche Chapell, Merschapell), Linc., i. g. 1081 (17), 1335 (11 p. 657, 12); ii. g. 496 (44). Marshal, Earl [of Scotland]. See Marischal. Marshal, the [of Hesse]. See Baumbach, L.
Marshal of the West, the, i. 7 (p. 5). i.e. Michael Joseph. Marshall, Chr., i. g. 1081 (28). -, Eliz., i. g. 621 (12 p. 310). -, Geo., ii. 1068 (19 p. 536). -, Guy, ii. g. 266 (35). -, (Mershall), John, i. 63, 557 (f. 34):g. 1081 (28), 1335 (12 p. 659); ii. g. 707 (10). -, Laur., i. g. 465 (70). -, Mary, prioress of Rosedale, i. 557 (f. 21). -, (Mershall), Miles, i. g. 846 (53). -, Ric., clk., ii. g. 1068 (41). -, Robt., i. g. 621 (12 p. 308). -, Thos., ii. g. 1068 (19 p. 537). -, Wm., i. 557 (f. 10):g. 465 (79), 620 (8 p. 300), 1081 (28), 1335 (51). Marsham, John, ii. g. 910 (4). Marshar, John, i. g.1081 (19 p. 522). Marshe, the, in Scotland. See Merse. Marshfield (Marresfelde), Glouc., ii. 418 (96). Marshland (the mershelaunde), Norf. and Camb., i. g. 622 (p. 314), 623 (p. 324). Marshland (Mersheland), Yorks., ii. g. 1068 (19 pp. 5378, 52). Marsintowne, in Scotland. See Mersington. Marshe (Maske), Yorks., i. g. 465 (30), 623 (p. 323). Marston, Oxon, ii. g. 1068 (50). Marston, Salop, ii. g. 1068 (42). Marston, Agnes, i. g. 282 (20). -, Ralph, i. g. 282 (20). -, (Merston), Thos., i. g. 282 (24), 465 (101 p. 229); ii. 688. Marstowe in Evesham, Worc., ii. g. 266 (7). Marsupinus, . King Ferdinand's secretary, i. 1216. Martell, Chr., sovereign of Kinsale, ii. 29 (1, 2). -, -, signature of, ii. 20 (2). Martelosso, Jeronimo, letter to, i. 1310. 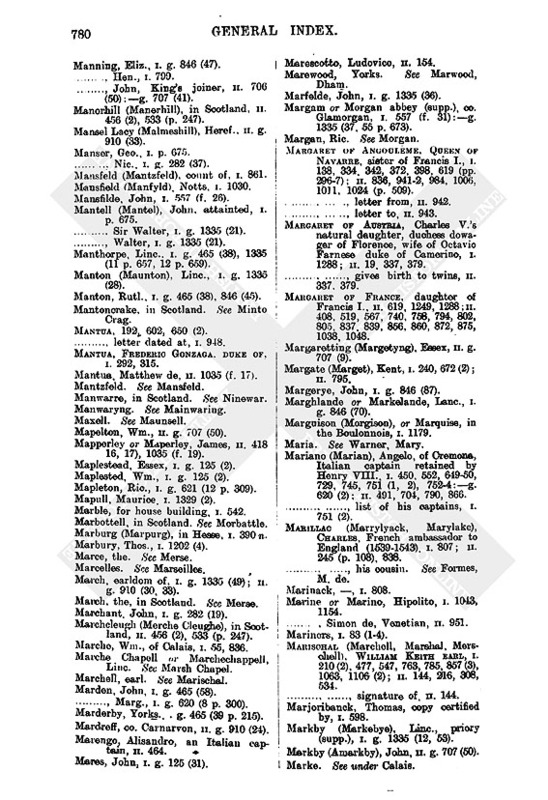 Marten, Dr. See Kyrnbeck, M.
Martenbecke or Martinbecke, Hans, i. 1295; ii. 72. Marthar Tydvell. See Merthyr Tydfil. Martin (Merton), Linc., i. g. 846 (53), 1081 (58). Martin (Merten), David, i. g. 465 (63, 101). -, (Marten), Humph., i. 557 (f. 14). -, (Martyn, Marten), John, i. g. 465 (21), 1335 (18); ii. 1035 (f. 29). -, (Marten), Mary, i. 557 (f. 14). -, Ric, i. 68:g. 624 (5). -, (Merten), Robt., ii. 186 (1, 4). -, Thos., i. 1202 xiv.:g. 624 (5). -, Wm, i. g. 620 (4). Martindale, Chr., i. g. 135 (27). -, Cuthb., i. g. 1335 (27). -, (Martendale), John. ii. g. 496 (5). Martinez, Juan. See Recalde. J. M. de. Martlesham (Martileshame), Suff., i g. 465 (58). Martock, Soms., i. g. 621 (1). Marton. Linc., i. g. 465 (38); ii. g. 1068 (19, pp. 535, 538). Marton, Salop, i. g. 1335 (23). Marton, in Scotland. See Mertoun. Marton, Warw., i. g. 1081 (47), 1335 (39). Marton, Yorks., i. p. 675:g. 465 (39 pp. 2145). Marton (Marten), near Bridlington, Yorks., i. g. 465 (25). Marton in Cleveland, Yorks., i g 282 (52); ii. g. 266 (23). Marton in the Forest, Yorks., priory (supp. ), i. g. 465 (30 pp. 214, 216), 621 (12 p. 310), 1081 (19 pp. 5212); ii. g. 1068 (19 p. 537). -, -, prior. See Yodson, T.
Marton, West- (Westmerton), Yorks., i. g. 282 (52). Marton, , i. g. 1335 (11 p. 657). Marum, Linc., i. g. 465 (38). Marvol, M., Charles V.'s ambassador in France in 1542, ii. 561 (p. 262). 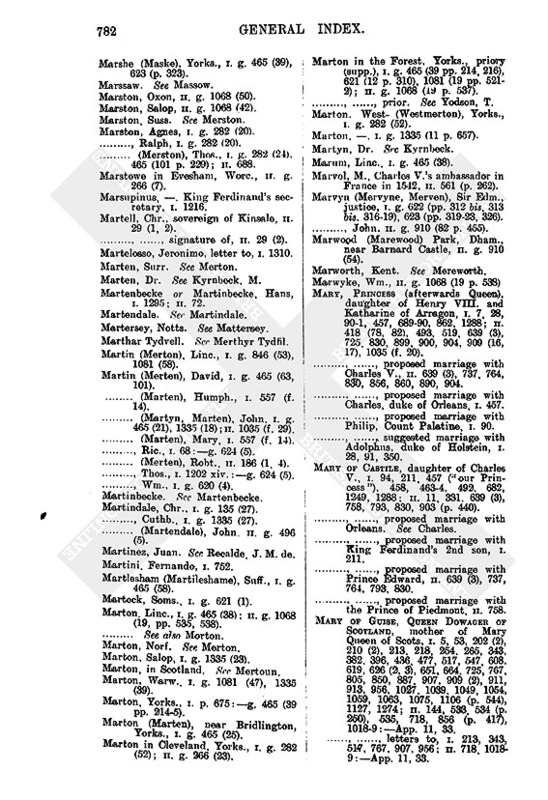 Marvyn (Mervyne, Merven), Sir Edm., justice, i. g. 622 (pp. 312 bis, 313 bis, 31619), 623 (pp. 31923, 326). -, John. ii. g. 910 (82 p. 455). Marwood (Marewood) Park, Dham., near Barnard Castle, ii. g. 910 (54). Mary, Princess (afterwards Queen), daughter of Henry VIII. and Katharine of Arragon, i. 7, 28, 901, 457, 68990, 862, 1288; ii. 418 (78, 82), 493, 519, 639 (3), 725, 830, 899, 900, 904, 909 (16, 17), 1035 (f. 20). -, -, proposed marriage with Charles V., ii. 639 (3), 737, 764, 830, 856, 860, 890, 904. -, -, proposed marriage with Charles, duke of Orleans, i. 457. -, -, proposed marriage with Philip, Count Palatine, i. 90. -, -, suggested marriage with Adolphus, duke of Holstein, i. 28, 91, 350. Mary of Castile, daughter of Charles V., i. 94, 211, 457 ("our Princess"), 458, 4634, 492, 682, 1249, 1288; ii. 11, 331. 639 ((3), 758, 793, 830, 903 (p. 440). -, -, proposed marriage with Orleans. See Charles. -, -, proposed marriage with King Ferdinand's 2nd son, i. 211. -, -, proposed marriage with Prince Edward, ii. 639 (3), 737, 764, 793, 830. -, -, proposed marriage with the Prince of Piedmont, ii. 758. Mary of Guise, Queen Dowager of Scotland, mother of Mary Queen of Scots, i. 5, 53, 202 (2), 210 (2), 213, 218, 254. 265, 343, 382, 396, 436, 477, 517, 547, 608, 619, 626 (2, 3), 651, 664, 725, 767, 805, 850, 887, 907, 909 (2), 911, 913, 956, 1027, 1039, 1049, 1054, 1059, 1063, 1075, 1106 (p. 544), 1127, 1274; ii. 144, 538 534 (p. 250), 535, 718, 856 (p. 417), 10189:App. 11, 33. -, -, letters to, i. 213, 343, 517, 767, 907, 956; ii. 718 10189:App. 11, 33. Mary, Queen Dowager op Hungary, Regent of Flanders, sister of Charles V., letters from, i. 329, 389, 503, 659, 720, 954, 1267; ii. 77, 100, 195, 466. -, -, letters to, i. 1, 44, 225, 337, 345, 365, 375, 544, 577, 585, 616, 690, 850, 927, 972, 1088, 1114, 1155, 1253, 1294; ii. 56, 90, 127, 1789, 399, 422, 556, 590. -, -, English ambassador with, ii. App. 27 iii., iv. See Carne, Sir E.
-, -, her matre d'hotel. See Noirthoudt. -, -, other references, i. 7 (pp. 2, 3, 5), 12, 36, 467, 54 (p. 26), 65, 70, 103, 1689, 177, 188. 227, 231, 237, 246, 281, 302, 3045, 322, 332, 334 353, 3712, 425 (pp. 18990), 448, 463, 469, 4734, 492, 498, 545, 549, 556, 568, 576, 5889, 5934, 598, 606, 632, 6478, 655 (p. 341), 689, 709, 760, 764, 800 (2), 805, 807, 825 (p. 407), 9156, 922 (p. 455), 933 (pp. 45960), 942, 946, 959, 973, 983 (p. 477), 984, 9923, 996, 1006, 1016, 1018, 1036, 1053, 1087 (pp. 5367), 1147, 1149, 1156, 1165, 1168, 1180, 1186, 1197 (p. 583), 1198, 1202, 1219, 1225, 1233, 1239, 1248, 1266, 1292 (p. 639), 1300, 1305; ii. 312 37, 55. 57, 59, 91, 113, 131. 149, 180, 203, 217, 2334, 243, 245, 255, 260, 2767, 283, 3312, 334 337, 380, 388, 3923 407, 411, 416, 421, 433, 437, 443, 460 (3), 485, 493. 521, 547, 594, 604, 610, 642, 667 (p. 304), 678, 7301, 740, 7489, 794 799, 8013, 831, 839, 907, 977, 1006, 1015, 1024. Mary of Portugal, wife of Philip, prince of Spain (died 12 July, 1545), i. 1092, 1206, 124950, 1301, 1316; ii. 31, 456, 70, 135, 149, 2334, 245, 830. Mary, Queen of Scots, daughter of James V. and Mary of Guise (born 8 Dec. 1542) i. 5, 6 84, 129 (p. 61), 132, 149, 1856, 200, 217, 279, 413, 472, 516, 547, 571, 6001, 611, 6156, 619 (pp. 2967), 626 (3), 630, 636, 652, 664, 805, 819, 1163, 1274; ii. 42, 311, 534 (p. 250), 535, 622, 856, 890, 917, 925, 984, 993, 1011, 1024:App. 11. -, -, letters, from, i. 6. 149, 1856, 200, 413, 472 516, 6001, 611, 6156, 636, 819. -, -, proposed marriage with Prince Edward. See Scotland; treaties with. -, -, proposed marriage with a son of King Ferdinand. i. 84, 255, 508 ( 244) 571, 630, 652, 689, 696 (2), 805 (p. 398 n), 850. -, -, proposed marriage in France, i. 5. -, -, to marry the son of Arran, or of Argyle, i. 664; ii. 535, 622, 926. -, -, secretary of. See Paniter, D.
Maryell or Moryell, Oliver, ii. g. 910 (77). 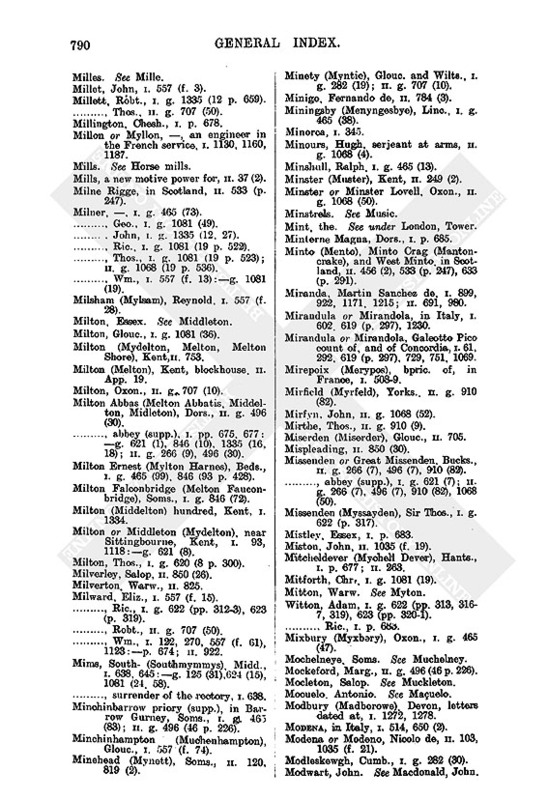 Marylebone (Marybone, Marybourne), Midd., i. 557 (ff. 66, 73); ii. g. 707 (24). Masham, Yorks., i. g. 1081 (24). -, prebend of, in York cathedral, i. 832:g. 465 (2), 1081 (24). Mason, John, French secretary and clerk of the Privy Council, handwriting of, i. 106, 129, 297, 325, 464 (3), 592, 593 (p. 289), 603, 761, 841, 877, 950; ii. 548, 585, 736, 995, 1030. -, -, other references, i. 7, 106, 131, 337, 345 (pp. 1567), 591 1213; ii. 637, 751, 881, 909 (9, 10, 11, 34), 978, 1022 n, 1062; ii. g. 910 (278). Mason, . ii. g. 1068 (19 p. 537). -, Agnes, i. g. 621 (12 p. 308). -, Alex., i. g. 1081 (19 p. 522). -, Geoff., ii. g. 1068 (46). -, George, vicar of Crediton, ii. g. 496 (38). -, John, i. g. 621 (12 p. 310), 1081 (19 p. 521). -, (Mayson), Ric., i. g. 624 (5). -, (Mayson), Robt., ii. g. 1068 (19 p. 538). -, Rog., i. g. 465 (13). -, Steph., ii. g. 707 (52), 1068 (52). -, (Masoon), Thos., i. g. 621 (12 p. 310), 1081 (49); ii. g. 707 (50). -, Wm, i. g. 620 (8). Mass, the, i. 390; ii. 733. Massarello, Angelo, secretary of the Council of Trent, ii. 498, 894. Masse, Chantoque de, i. 833. Massendewe, in Scotland. See Maisondieu. Massey or Massy, Sir John, searcher at Chester, i. 538, 881. -, (Masse), John, i. 557 (f. 5):g. 622 (p. 316); ii. 1035 (f. 29):g. 1068 (50). -, Thos., ii. g. 707 (43). Massingham Parva, Norf., ii. g. 496 (68). Massow (Marssaw), Laurence, a captain of the Duke of Lauenburg, ii. 75 ii., 832, 958. Master (Maister), John, i. g. 622 (p. 315). Mastreght or Mastricke. ,See Maastricht. Masts and spars, for ships, i. 494 (3), 496, 557 (f. 60), 676, 987; ii. 176, 211, 222, 241 (p. 106). Matching, Essex, i. g. 465 (55). Mather, Alex., ii. g. 266 (31), 910 (82 p. 455). Mathew or Mathewe, Edw., i. g. 465 (21). -, (Moythe), Hugh, i. 557 (f. 13). -, Ric, i. g. 282 (19), 846 (59), 1081 (24); ii. g. 266 (36). -, Robt., i. p. 674. -, (Matty), Thomas (the Bible issued under the name of), ii. 733 (p. 346). -, Wm., ii. g. 1068 (32). Mathewes, Ric., i. g. 846 (59). Mathon (Mathyn), Worc., ii. g. 1068 (35). Matravers (i.e. Maltravers), Dame Anne, ii. g. 1068 (37). -, lord. See Arundel, earl of. Mattersey (Martersey), Notts., priory (supp. ), ii. g. 1068 (19 p. 536). Mattresses, i. 557 (f. 59). Mattyns, John, ii. g. 1068 (19 p. 536). Maufron, Morgante, ii. 916. See Morgante. Maunche, John, ii. 1035 (f. 26). Maunde, John, i. g. 620 (8 p. 300). Maundeley, John, i. g. 465 (83). Maundesley, Wm., i. g. 1335 (13). Maunditts (Mawdyttes), Wilts., near Somerford, i. g. 465 (101). Maunsell (Manxell), Sir Rice. i. 1105:g. 622 (pp. 316, 319); ii. App. 13. -, -, signature of, i. 1105. -, (Mauncell), Ric., i. p. 675: ii. 1067 (24):g. 1068 (39). -, (Mauncell), Thos., i. g. 496 (7). Maurice (Morice), Duke. See Saxony, duke Maurice of. Mauritius, servant to David Paniter, i. 696 (2). Maverle or Maverlie, M., ii. 8701. Mawde, John, i. g. 465 (10); ii. g. 266 (21). Mawdeley, John, i. g. 465 (83), 622 (p. 317). -, Ric., i. g. 465 (83). 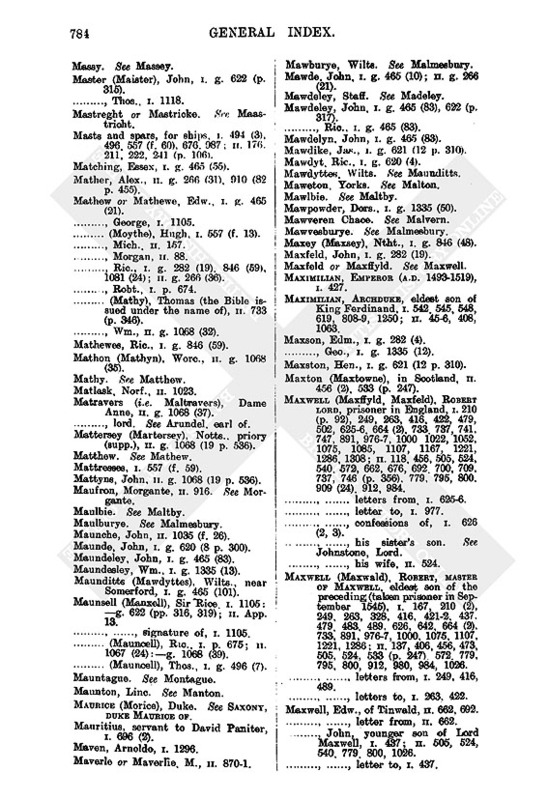 Mawdelyn, John, i. g. 465 (83). Mawdike, Jas., i. g. 621 (12 p. 310). Mawdyt, Ric., i. g. 620 (4). Mawpowder, Dors., i. g. 1335 (50). Maxey (Maxsey), Ntht., i. g. 846 (48). Maxfeld, John, i. g. 282 (19). Maxfeld or Maxffyld. See Maxwell. Maximilian, Emperor (a.d. 1493519), i. 427. Maximilian, Archduke, eldest son of King Ferdinand, i. 542, 545, 548, 619, 8089, 1250; ii. 456, 408, 1063. Maxson, Edm., i. g. 282 (4). -, Geo., i. g. 1335 (12). Maxston, Hen., i. g. 621 (12 p. 310). Maxton (Maxtowne), in Scotland, ii. 456 (2), 533 (p. 247). Maxwell (Maxffyld, Maxfeld), Robert lord, prisoner in England, i. 210 (p. 92), 249, 263, 416, 422, 479, 502, 6256, 664 (2), 733 737, 741, 747, 891, 9767, 1000 1022, 1052, 1075, 1085, 1107, 1167, 1221, 1286, 1308; ii. 118, 456, 505, 524, 540, 572, 662, 676, 692, 700, 709, 737, 746 (p. 356), 779, 795, 800, 909 (24), 912, 984. -, -, letters from. i. 6256. -, -, letter to, i. 977. -, -, confessions of, i. 626 (2, 3). -, -, his sister's son. See Johnstone, Lord. -, -, his wife, ii. 524. Maxwell (Maxwald), Robert, master of Maxwell, eldest son of the preceding (taken prisoner in September 1545), i. 167, 210 (2), 249, 263, 328, 416, 4212, 437, 479, 483, 489, 626, 642, 664 (2), 733', 891, 9767, 1000, 1075, 1107, 1221, 1286; ii. 137, 406, 456, 473, 505, 524, 533 (p. 247) 572, 779, 795, 800, 912, 980, 984, 1026. -, -, letters from, i. 249, 416, 489. -, -, letters to, i. 263, 422. Maxwell, Edw., of Tinwald, ii. 662, 692. -, -, letter from, ii. 662. -, John, younger son of Lord Maxwell, i. 437; ii. 505, 524, 540, 779, 800, 1026. -, -, letter to, i. 437. -, John of Breckonside, ii. 662, 692. -, John, of Cowhill, cousin of Lord Maxwell, ii. 505, 523, 676. -, Richard, ii. g. 910 (80). Maxwellheugh (Maxwell Hughe), beside Kelso, ii. 347, 456 (2), 533 (p. 247). Maxwells, the Scottish family, ii. 676, 700. Maycott, , i. g. 465 (79). Maye (Maie), Dr., ii. 706 (92). -, Henry, sent as messenger to Peter of Gueldres, i. 31, 550, 633, 693, 765. -, (May), John, i. 68:p. 682; ii. 631. -, Ric, i. g. 846 (93). -, (May), Robt., i. g. 288 (52). Mayer (Maior), Anastasia, ii. g. 496 (54). -, (Maior), Edw., i. g. 1335 (21). -, (Maior), William prior of St. Mary Spitell, i. 557 (f. 1). Mayfield (Mayfelde), Suss., i. g. 282 (52 bis). Mayland, Essex, i. g. 846 (93 p. 427), 1335 (55). Mayle, Barth., i. g. 1335 (37). Mayler, John, printer, App. 1. -, Joan, i. g. 620 (8). -, John, i. g. 465 (99), 620 (55), 846 (93 p. 428). -, Margery, i. g. 846 (93 p. 428). -, Ric., i. g. 1335 (13). Mayne, Thos., ii. g. 910 (21). Mayneman, John, ii. g. 1068 (19 p. 538). Maynordeilo, co. Carmarthen, i. g. 1081 (13). Mayott, Ric., ii. g. 496 (29). Mayre (Maire), John, i. 557 (f. 13). Mayrson, Robt., i. g. 282 (52 p. 129). Mayton, Thos., i. 846 (3). Meal. See under Grain, Wheat. Meanstoke, Hants. See Meon Stoke. Measham (Meysham, Leic. ), Derb., ii. g. 496 (34). Meath, Edward Staples, bp. of, one of the Council of Ireland, signature ii. 792. Meaux (Meux, Melsa) abbey (supp. ), in Holderness, i. 557 (f. 35):pp. 675, 682, 684 bis:g. 465 (39 pp. 2156, 81), 1081 (19 p. 5213). Meawe (Mewve Meuwe, Mewe), Victor, letters from, i. 802, 929, 945, 953. -, -, letter to, ii. App. 43 (3). -, -, other references, ii. 426, 6989, 939. Meawtas or Meawtys. See Mewtas. 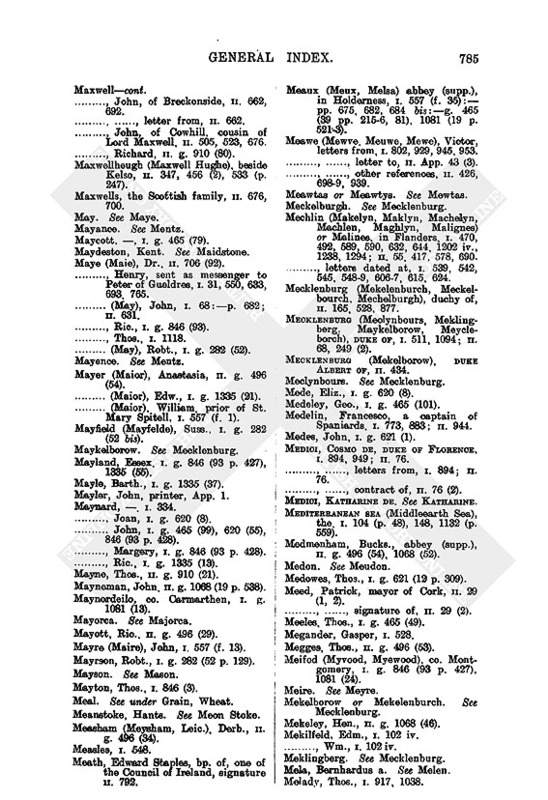 Mechlin (Makelyn, Maklyn, Machelyn, Machlen, Maghlyn, Malignes) or Malines, in Flanders, i. 470, 492, 589, 590, 632, 644, 1202 iv., 1238, 1294; ii. 55, 417, 578, 690. Mecklenburg (Mekelenburch, Meckelbouroh, Mechelburgh), duchy of, ii. 165, 528, 877. Meoklenburg (Meclynbours, Meklingberg, Maykelborow, Meycleborch), duck of, i. 511, 1094; ii. 68, 249 (2). Mecklenburg (Mekelborow), duke Albert of, ii. 434. Mede, Eliz., i. g. 620 (8). Medeley, Geo., i. g. 465 (101). Medelin, Francesco, a captain of Spaniards, i. 773, 883; ii. 944. Medes, John, i. g. 621 (1). Medici, Cosmo de, duke of Florence, i. 894, 949; ii. 76. -, -, letters from, i. 894; ii. 76. -, -, contract of, ii. 76(2). Medici, Katharine de. See Katharine. Mediterranean sea (Middleearth Sea), the i. 104 (p. 48), 148, 1132 (p. 559). Medmenham, Bucks., abbey (supp. ), ii. g. 496 (54), 1068 (52). Medowes, Thos., i. g. 621 (12 p. 309). Meed, Patrick, mayor of Cork, ii. 29 (1, 2). -, -, signature of, ii. 29 (2). Meeles, Thos., i. g. 465 (49). Megges, Thos., ii. g. 496 (53). Meifod (Myvood, Myewood), co. Montgomery, i. g. 846 (93 p. 427), 1081 (24). Mekelborow or Mekelenburch. See Mecklenburg. Mekeley, Hen., ii. g. 1068 (46). Mekilfeld, Edm., i. 102 iv. -, Wm., K. 102 iv. Mela, Bernhardus a. See Melen. Melady, Thos., i. 917, 1038. Melbury, Soms., i. p. 675. Melchburn (Melchbourne). Beds., preceptory (supp.) of St. John, ii. g. 910 (82 p. 455). Melche, Rol., i. g. 621 (12 p. 310). Melcher, a captain of the Duke of Lauenburg, ii. 832, 958. Melchett or Melchute, in Alderbury, Wilts., ii. 850 (6). Melcombe (Melcome), Dors., ii. 186. Meldrum, Sir George, laird of Fyvie, q.v. Melen, Sir Bernhard von (Bernardus a Mela, van Melant), administrator of Brunswick-Wolfenbuttel, i. 967, 1271; ii. 68, 69 (p. 35), 358. Melfi, prince of. See Doria, A.
Melfi (Melfy), Prince of, in the French service, i. 158. Melford, Suff., i. g. 125 (2). Melford, Long- Suff., ii. g. 910 (53). Melford Monachorum or Monks Manor, Suff., ii. g. 910 (53). Melford (Mylford) Parva, Suff., i. g. 125 (2). Melle, Hugh, i. g. 620 (28). Mellers, John, i. p. 680. Mellerstone (Mylstanes), in Scotland, ii. 1049. Melles, Suff., ii. g. 910 (82 p. 455). Mells (Meles), Soms., ii. g. 1068 (52). Mellys, Wm, i. g. 1335 (51). Mellyshe, Robt., i. g. 846 (93). 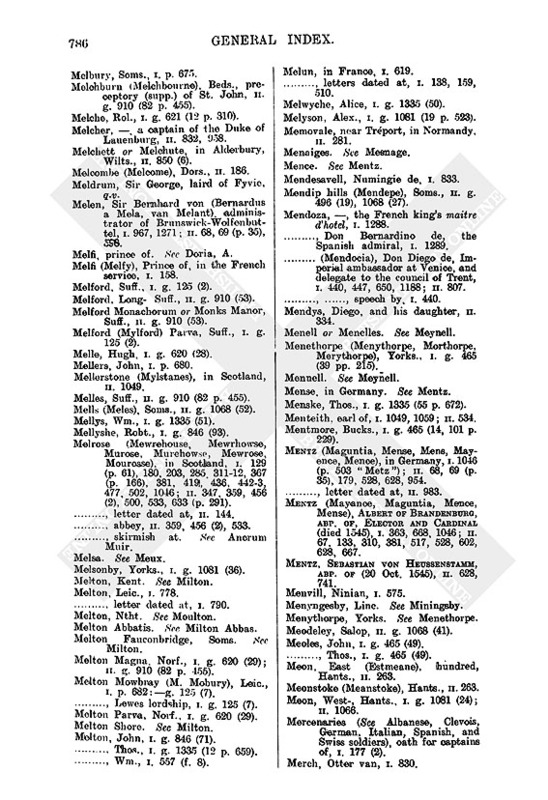 Melrose (Mewrehouse, Mewrhowse, Murose, Murehowse, Mewrose, Mourosse), in Scotland, i. 129 (p. 61), 180, 203, 285, 31112, 367 (p. 166), 381, 419, 436, 4423, 477, 502, 1046; ii. 347, 359, 456 (2), 500, 533, 633 (p. 291). -, letter dated at, ii. 144. -, abbey, ii. 359, 456 (2), 533. -, skirmish at. See Ancrum Muir. Melsonby, Yorks., i. g. 1081 (36). -, letter dated at, i. 790. Melton Abbatis. See Milton Abbas. Melton Fauconbridge, Soms. See Milton. Melton Magna, Norf., i. g. 620 (29); ii. g. 910 (82 p. 455). 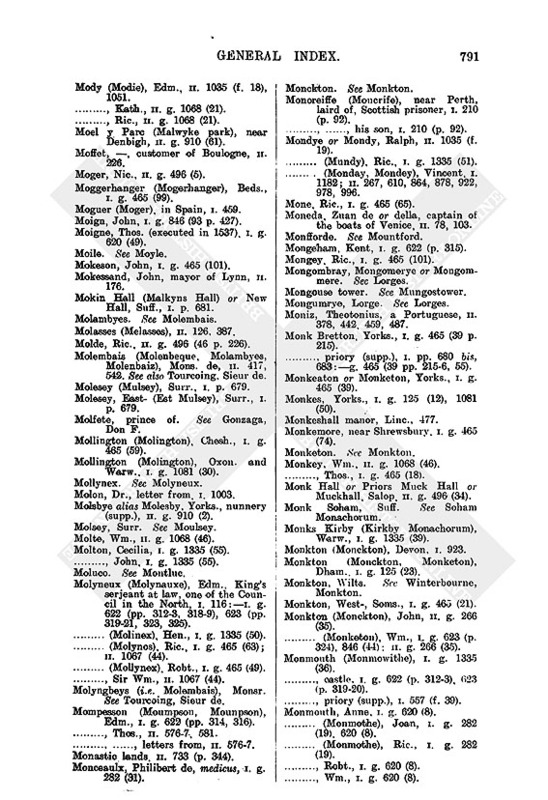 Melton Mowbray (M. Mobury), Leic., i. p. 682:g. 125 (7). -, Lewes lordship, i. g. 125 (7). Melton Parva, Norf., i. g. 620 (29). Melton, John, i. g. 846 (71). -, Wm., i. 557 (f. 8). Melun, in France, i. 619. -, letters dated at, i. 138, 159, 510. Melwyche, Alice, i. g. 1335 (50). Melyson, Alex., i. g. 1081 (19 p. 523). Memovale, near Treport, in Normandy, ii. 281. Mendesavell, Numingie de, i. 833. Mendip hills (Mendepe), Soms., ii. g. 496 (19), 1068 (27). Mendoza, , the French king's maitre d'hotel, i. 1288. -, Don Bernardino de, the Spanish admiral, i. 1289. -, (Mendocia), Don Diego de, Imperial ambassador at Venice, and delegate to the council of Trent, i. 440, 447, 650, 1188; ii. 807. -, -, speech by, i. 440. Mendys, Diego, and his daughter, ii. 334. Menell or Menelles. See Meynell. Menethorpe (Menythorpe, Morthorpe, Merythorpe), Yorks., i. g. 465 (39 pp. 215). Mense, in Germany. See Mentz. Menske, Thos., i. g. 1335 (55 p. 672). Menteith, earl of, i. 1049, 1059; ii. 534. Mentmore, Bucks., i. g. 465 (14, 101 p. 229). Mentz (Maguntia, Mense, Mens, Mayence, Mence), in Germany, i.1046 (p. 503 "Metz"); ii. 68, 69 (p. 35), 179, 528, 628, 954. -, letter dated at, ii. 983. Mentz (Mayance, Maguntia, Mence, Mense), Albert of Brandenburg, abp. of, Elector and Cardinal (died 1545), i. 363, 668, 1046; ii. 67, 133, 310, 381, 517, 528, 602, 628, 667. Mentz, Sebastian von Heussenstamm, abp. of (20 Oct. 1545), ii. 628, 741. Meodeley, Salop, ii. g. 1068 (41). Meoles, John, i. g. 465 (49). -, Thos., i. g. 465 (49). Meon, East (Estmeane), hundred, Hants., ii. 263. Meonstoke (Meanstoke), Hants., ii. 263. Meon, West-, Hants., i. g. 1081 (24); ii. 1066. Swiss soldiers), oath for captains of, i. 177 (2). Merch, Otter van, i. 830. Merchant Adventurers, the Company of (See also Antwerp, English merchants at), I 32, 65, 150, 163 4, 171, 1967, 590, 633, 852; ii. 243, 1004. -, -, letter to the Company, i. 32. -, deputy of. See Lucar, Emanuel. Merche, in Scotland. See Merse. Mere (Meyre), Chesh., i. p. 678. Mere Deane, in Scotland. See Muirdean. Mere Place or More Place, Heref., i. g. 846 (11, 93 p. 427). Mere, Wm., i. g. 465 (45). Merefeld, John, i. g. 620 (40). Mereman, Ric, i. g. 1335 (51). -, Wm.. i. g. 621 (12 p. 309). Meremouth, Wm., i. g. 621 (12 p. 310). Mereon, John, i. g. 846 (72). Meres, John, i. g. 846 (87). Merevale (Meryvall), Warw. and Leic., abbey (supp. ), i. 557 (f. 37):p. 684:g. 621 (12 p. 309). Mereworth (Meryworth), Kent, i. g. 282 (52), 465 (101). Mergery, John, i. g. 846 (38). Meriden, Salop, i. g. 1081 (58). Qu. Merrington? Meringe, Marg., i. g. 1335 (26). -, Thos., i. g. 1335 (26). Merioneth, i. g. 846 (80). Merionethshire, ii. App. 4 (3). -, sheriff (15456), ii. g. 910 (52). Merivalle, Jan, ii. App. 43 (27). Merke, parson of. See under Calais. Merle, Ric., ii. g. 266 (23). Merreye, Ralph, i. g. 621 (12 p. 310). Merrington (Meriden, Mereden, Meryden), Salop, i. g. 1081 (58); ii. g. 910 (3), 1068 (42). Merschapell, Linc. See Marsh Chiapel. Merse (Marshe, Marce, Marse, Merche, March, Mershe, Merssheland), the, in Scotland, district on the East Borders, i. 129 (p. 61), 161, 187 (2), 355 (p. 162), 382, 395, 443, 626 (3), 837, 838 (2), 867; ii. 96, 216, 328, 369, 400, 414, 432, 456 (1, 2), 458, 500, 524, 5335, 540. Mersea (Marsey, Mersey, Marza), Essex, i. g. 622 (p. 315); ii. 1066. -, bulwark at, i. 3. Merselles or Mersellia. See Marseilles. Mersey, the river, ii. g. 1068 (22). Mersington (Marsintowne), in Scotland, ii. 456 (p. 199), 533 (p. 248), 1009. -, laird of. See Kerr, James. Merston (Marston), Suss., i. g. 621 (2). Merthyr Tydfil (Marthar Tydvell), co. Glamorgan, i. g. 465 (11). Merton (Marton), Norf., ii. g. 496 (68). Merton (Meryton), Oxon., i. p. 677. Merton (Marten), Surr., ii. g. 496 (25). -, priory (supp. ), i. pp. 676, 680:g. 620 (51); ii. g. 496 (25, 29, 68 p. 232). Mertoun (Marton), in Scotland ii. 456 (2), 533 (p. 247). -, laird of, i. 289 (2). Merven, Mervyn, or Mervyne. See Marvyn. Meryck, Jas., i. g. 1335 (49). -, (Merick), John, ii. 88. -, Nic., ii. g. 1068 (42). -, Ralph, ii. g. 1068 (42). Merygood, Rog., i. g. 282 (40). Meryman, Wm., i. g. 1335 (51). Meryng (Merynge), Fras., i. g. 622 (p. 314); ii. g. 910 (13). -, John, i. g. 620 (8 pp. 299, 300 bis). Merypos or Meripos. See Mirepoix. Merys, Ant., i. g. 622 (p. 316). Meryt, Agnes, i. 557 (f. 6). Meryvall or Meryvalle. See Merevale. Mesenden or Mesendyn, Barnard, i. g. 465 (22 p. 212), 1335 (55 p. 672). Mesnage or Mesnaige (Menaiges), Mons., French ambassador with Charles V., i. 425 (p. 187), 539, 545, 5878, 652, 861, 1018 1242; ii. 45, 59, 257, 594, 615, 624, 695, 714, 772, 915. Messe, John, i. g. 846 (93 p. 428). Messenger (Messynger), Eliz., ii. g. 1068 (52). -, John, i. g. 1335 (27). -, (Mesenger), Ric., i. g. 465 (99). -, (Messynger), Wm., ii. g. 1068 (52). Messina, in Italy, i. 1280. Messingham, Linc., i. g. 1335 (12). Mesure, Wm., i. 1202 (4). Metcalf (Metcalff), Arth., ii. g. 1068 (19 p. 536). -, Chr., i. g. 465 (26), 623 (pp. 323, 325). -, Gilb., i. g. 465 (26). -, Humph., i. g. 465 (101), 620 (55), 621 (14). -, Percival, i. g. 1081 (19 p. 521). Metham, Thos., i. g. 125 (23). Methven (Methwen), Henry Stewart lord, i. 819, 1049, 1059, 1075. Methwolde, Norf., i. g. 1335 (36). Metz (Mettes, Metys), in Lorraine, i. 315, 735, 807 (p. 400) 808, 918, 1046; ii. 9, 381, 417, 421. Metz, Nicholas, bp. of (so called), afterwards (a.d. 1569) duke of Mercoeur, brother of Francis duke of Lorraine, i. 1288. Meudon (Medon), Ant. Sanguin, cardinal of, bp. of Orleans, grand almoner of France and uncle of Madame d'Etampes i. 92, 94, 217, 1066 (p. 512). Meuse (Mase, Maase, Mose, Mouse, Muse), the river, ii. 180, 297 (p. 137), 352 (p. 158), 356, 522 (1, 2), 523, 527 (pp. 2434), 541, 563, 605, 636 (2), 766. Meverell, Arthur, prior of Tutbury, i. 557 (f. 18). -, Fras., i. g. 622 (p. 316), 623 (p. 322). -, John, i. g. 1335 (10). -, Thos., ii. App. 2 (2 iv.). Mewes, John, i. 1329 (p. 653). Mewgh, Eleanor, John, Mary, and Michael, ii. g. 496 (46). Mewrehouse, in Scotland. See Melrose. Mewtas (Mewtes, Meawtys, Meawtas, Meutas), Sir Peter, gentleman of the Privy Chamber, captain of Guernsey (26 March 1545), i. 557 (f. 58), 799:g. 282 (7), 465 (39 p. 215, 87); ii. App. 2 (1, 2 vi.). Meyer, Salop, ii. g. 496 (58). Meyer, Ralph, i. g. 465 (99). Meyers or Meyres, Peter, i. 841, 997. Meykfell, Cumb., i. g. 282 (30). Meykyn, Wm., i. g..846 (59). Meynell (Menelles, Menell, Mennell), Robt., i. g. 465 (39 p. 215), 623 (pp. 323, 325), 1081 (19 p. 522); ii. g. 910 (57). Meyre (Meire), Hugh, i. p. 678; ii. 1033. -, -, letter from, ii. 1033. -, (Meyr), Ric., i. g. 846 (59). -, Thos., i. p. 678. -, William, of Stralsund, ii. 657. Meysham, Leic. See Meastham, Derb. Mezieres (Mesieres, Messiers, Masiers), in France, i. 918; ii. 468, 527, 605, 636. Michaele (Myghell), Jerome, i. 1141 (2). -, Seor Petro, a Spanish captain, i. 737, 821. Michaelston (St. Michael), co. Monmouth, i. g. 1335 (37). Michaheli or Micaeli (Michely), Francisco, i. 1316 (2); ii. 9, 92, 340, 355. Michelham (Michellam) alias Michelham Parkgate alias Michelham Downeashe, near Hailsham, Suss., priory (supp. ), i. 557 (f. 34):g. 282 (52). Michell (Mychele), , i. 1297; ii. 620. -, Agnes, i. g. 620 (8). -, Edm. or Edw., i. g. 622 (p. 319), 623 (p. 324). -, (Mychel), Edw., clk., treasurer of Gloucester cathedral, ii. 813. -, Ellen, ii. 850 (19). -, (Michill), Jas., ii. g. 910 (1). -, (Michel. Michill), John, i. 856:g. 622 (p. 319), 623 (p. 324), 1335 (2); ii. 850 (19):g. 496 (19), 1068 (19 p. 538). -, Rich., i. g. 846 (8). -, Sampson, a clerk of Chancery, i. 102:g. 465 (101). -, Thos., i. g. 622 (p. 319), 623 (pp. 324, 326); ii. g. 496 (7). -, (Mychel), Wm., i. g. 620 (8); ii. 813. Mickleham (Mykelham), Surr., ii. g. 910 (32). Mickleton (Mykylton), Glouc., i. p. 677. Middelburg (Middelbroghe, Meydylbrycht, Mydellbourghe, Myddleburgh), in Zealand., i. 103, 352, 509, 1162 (2), 1194, 1202 vii. ; ii. 4, 483. Middelen, in Bremen.. See Midlum. Middle, Salop, ii. g. 1068 (42). Middleham (Middelham), Yorks., i. g. 465 (10), 1081 (26). Middleham, Bishops- (Mydleham), Dham., i. p. 684. Middleham (Mydelham), Robt., ii. 186. Middlehurst, Chr., ii. g. 1068 (22). Middlemore, Robt., ii. g. 1068 (41). -, Rog., ii. g. 1068(41). -, (Myddelmore), Thos., a partic. receiver of Augmentations, i. p. 675. Middlesex, i. 18, 557 (ff. 59, 70), 713, 888, 1078 bis:g. 125 (28), 846 (25), 1081 (33), 1335 (35); ii. 645, 909 (25):g. 707 (35):App. 4 (3). 345. -, commission of peace, i. g. 622 (p. 319). -, (and Kent), escheator, ii. g. 910 (13). Middlesex, archd. of. See Eden, R.
Middleton (Mydelton, Myddelton), or Milton, Essex, i. g. 125 (2); ii. 1066. Middleton (Middelton), Salop, ii. 850 (26). 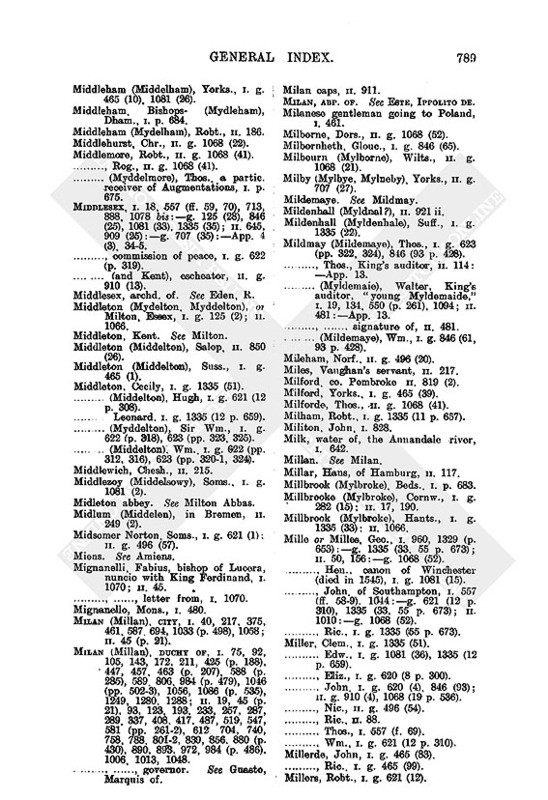 Middleton (Middelton), Suss., i. g. 465 (1). Middleton, Cecily, i. g. 1335 (51). -, (Middelton), Hugh, i. g. 621 (12 p. 308). -, Leonard, i. g. 1335 (12 p. 659). -, (Myddelton), Sir Wm., i. g. 622 (p. 318), 623 (pp. 323, 325). -, (Middelton), Wm., i. g. 622 (pp. 312, 316), 623 (pp. 3201, 324). Middlezoy (Middelsowy), Soms., i. g. 1081 (2). Midleton abbey. See Milton Abbas. Midlum (Middelen), in Bremen, ii. 249 (2). Midsomer Norton, Soms., i. g. 621 (1); ii. g. 496 (57). Mignanelli, Fabius, bishop of Lucera, nuncio with King Ferdinand, i. 1070; ii. 45. -, -, letter from, i. 1070. Milan (Millan), city, i. 40, 217, 375, 461, 587 694, 1033 (p. 498), 1058; ii. 45 (p. 21). Milan (Millan), duchy of, i. 75, 92, 105, 143, 172, 211, 425 (p. 188), 447, 457, 463 (p. 207), .588 (p. 285), 589 806, 984 (p. 479), 1046 (pp. 5023), 1056, 1086 (p. 535), 1249, 1280, 1288; ii. 19, 45 (p. 21), 93, 123, 193, 233, 257, 287, 289, 337, 408, 417, 487, 519, 547, 581 (pp. 2612), 612 704, 740, 758, 788, 8012, 839, 856, 880 (p. 430), 890, 893, 972, 984 (p. 486), 1006, 1013, 1048. -, governor. See Guasto, Marquis of. Milan, abp. of. See Este, Ippolito de. Milanese gentleman going to Poland, i. 461. Milborne, Dors., ii. g. 1068 (52). Milbornheth, Glouc., i. g. 846 (65). Milbourn (Mylborne), Wilts., ii. g. 1068 (21). Milby (Mylbye, Mylneby), Yorks., ii. g. 707 (27). Mildenhall (Myldnal? ), ii. 921 ii. Mildenhall (Myldenhale), Suff., i. g. 1335 (22). Mildmay (Mildemaye), Thos., i. g. 623 (pp. 322, 324), 846 (93 p. 428). -, Thos., King's auditor, ii. 114:App. 13. -, (Myldemaie), Walter, King's auditor, "young Myldemaide," i. 19, 134, 550 (p. 261), 1094; ii. 481:App. 13. -, -, signature of, ii. 481. -, (Mildemaye), Wm., i. g. 846 (61, 93 p. 428). Mileham, Norf., ii. g. 496 (20). Miles, Vaughan's servant, ii. 217. Milford, co. Pembroke ii. 819 (2). Milford, Yorks., i. g. 465 (39). Milforde, Thos., ii. g. 1068 (41). Milham, Robt., i. g. 1335 (11 p. 657). Milk, water of, the Annandale river, i. 642. Millar, Hans, of Hamburg, ii. 117. Miilbrook (Mylbroke), Beds., i. p. 683. Millbrooke (Mylbroke), Cornw., i. g. 282 (15); ii. 17, 190. Millbrook (Mylbroke), Hants., i. g. 1335 (33): ii. 1066. Mille or Milles, Geo., i. 960, 1329 (p. 653):g. 1335 (33, 55 p. 673); ii. 50, 156:g. 1068 (52). -, Hen., canon of Winchester (died in 1545), i. g. 1081 (15). -, John, of Southampton, i. 557 (ff. 589), 1044:g. 621 (12 p.310), 1335 (33, 55 p. 673); ii. 1010:g. 1068 (52). -, Ric., i. g. 1335 (55 p. 673). Miller, Clem., i. g. 1335 (51). -, Edw., i. g. 1081 (36), 1335 (12 p. 659). -, Eliz., i. g. 620 (8 p. 300). -, John, i. g. 620 (4), 846 (93); ii. g. 910 (4), 1068 (19 p. 536). -, Nic., ii. g. 496 (54). -, Thos., i. 557 (f. 69). -, Wm., i. g. 621 (12 p. 310). Millerde, John, i. g. 465 (83). -, Ric. i. g. 465 (99). Millers, Robt., i. g. 621 (12). Millet, John, i. 557 (f. 3). Millett, Robt., i. g. 1335 (12 p. 659). -, Thos., ii. g. 707 (50). Millington, Chesh., i. p. 678. Millon or Myllon, , an engineer in the French service, i. 1130, 1160, 1187. Mills, a new motive power for, ii. 37 (2). Milne Rigge, in Scotland, ii. 533 (p. 247). Milner, , i. g. 465 (73). -, Geo., i. g. 1081 (49). -, John, i. g.1335 (12, 27). -, Ric., i. g. 1081 (19 p. 522). -, Thos., i. g. 1081 (19 p. 523); ii. g. 1068 (19 p. 536). -, Wm., i. 557 (f. 13):g. 1081 (19). Milsham (Mylsam), Reynold, i. 557 (f. 28). Milton, Glouc., i. g. 1081 (36). Milton (Mydelton, Melton, Melton Shore), Kent, ii. 753. Milton (Melton), Kent, blockhouse, ii. App. 19. Milton, Oxon., ii. g. 707 (10). Milton Abbas (Melton Abbatis, Middelton, Midleton), Dors., ii. g. 496 (30). -, abbey (supp. ), i. pp. 675, 677:g. 621 (1), 846 (10), 1335 (16, 18); ii. g. 266 (9), 496 (30). Milton Ernest (Mylton Harnes), Beds., i. g. 465 (99), 846 (93 p. 428). Milton Falconbridge (Melton Fauconbridge), Soms., i. g. 846 (72). Milton (Middelton) hundred, Kent, i. 1334. Milton or Middleton (Mydelton), near Sittingbourne, Kent, i. 93, 1118:g. 621 (8). Milton, Thos., i. g. 620 (8 p. 300). Milverley, Salop, ii. 850 (26). Milward, Eliz., i. 557 (f. 15). -, Ric., i. g. 622 (pp. 3123), 623 (p. 319). -, Robt., ii. g. 707 (50). -, Wm., i. 122, 270, 557 (f. 61), 1123:p. 674; ii. 922. Mims, South- (Southmymmys) Midd., i. 638, 645:g. 125 (31),624 (15), 1081 (24, 58). -, surrender of the rectory, i. 638. Minohinbarrow priory (supp. ), in Barrow Gurney, Soms., i. g. 465 (83); ii. g. 496 (46 p. 226). Minchinhampton (Muchenhampton) Glouc., i. 557 (f. 74). Minehead (Mynett), Soms., ii. 120, 819 (2). Minety (Myntie), Glouc. and Wilts., i. g. 282 (19); ii. g. 707 (10). Minigo, Fernando de, ii. 784 (3). Miningsby (Menyngesbye), Linc., i. g. 465 (38). Minours, Hugh, serjeant at arms, ii. g. 1068 (4). Minshull, Ralph, i. g. 465 (13). Minster (Muster), Kent, ii. 249 (2). Minster or Minster Lovell, Oxon., ii. g. 1068 (50). Mint, the. See under London, Tower. Minterne Magna, Dors., i. p. 685. Minto (Mento), Minto Crag (Mantoncrake), and West Minto in Scotland, ii. 456 (2), 533 (p. 347), 633 (p. 291). Miranda, Martin Sanchez de, i. 899, 922, 1171, 1215; ii. 691, 980. Mirandula or Mirandola, Galeotto Picocount of, and of Concordia, i. 61, 292, 619 (p. 297), 729, 751, 1069. Mirepoix (Merypos), bpric. of, in France, i. 5089. Mirfield (Myrfeld), Yorks., ii. g. 910 (82). Mirfyn, John, ii. g. 1068 (52). Mirthe, Thos., ii. g. 910 (9). Miserden (Miserder), Glouc., ii. 705. Missenden or Great Missenden, Bucks., ii. g. 266 (7), 496 (7), 910 (82). -, abbey (supp. ), i. g. 621 (7); ii. g. 266 (7), 496 (7), 910 (82), 1068 (50). Missenden (Myssayden), Sir Thos., i. g. 622 (p. 317). Mistley, Essex, i. p. 683. Miston, John, ii. 1035 (f. 19). Miitcheldever (Mychell Dever), Hants., i. p. 677; ii. 263. Mitforth, Chr. i. g. 1081 (19). Mitton, Warw. See My ton. Witton, Adam, i. g. 622 (pp. 313, 3167, 319), 623 (pp. 3201). -, Ric., i. p. 683. Mixbury (Myxbery), Oxon., i. g. 465 (47). Mockeford, Marg., ii. g. 496 (46 p. 226). Modbury (Madborowe) Devon, letters dated at, i. 1272, 1278. Modena, in Italy, i. 514, 650 (2). Modena or Modeno, Nicolo de, ii. 103, 1035 (f. 21). Modleskewgh, Cumb., i. g. 282 (30). Modwart, John. See Macdonald, John. Mody (Modie), Edm., ii. 1035 (f. 18), 1051. -, Kath., ii. g. 1068 (21). -, Ric., ii. g. 1068 (21). Moel y Parc (Malwyke park), near Denbigh, ii. g. 910 (61). Moffet, , customer of Boulogne, ii. 226. Moger, Nic., ii. g. 496 (5). Moggerhanger (Mogerhanger), Beds., i. g. 465 (99). Moguer (Moger), in Spain, i. 459. Moign, John, i. g. 846 (93 p. 427). Moigne, Thos. (executed in 1537), i. g. 620 (49). Mokeson, John, i. g. 465 (101). Mokessand, John, mayor of Lynn, ii. 176. Mokin Hall (Malkyns Hall) or New Hall, Suff., i. p. 681. Molasses (Melasses), ii. 126, 387. Molde, Ric., ii. g. 496 (46 p. 226). Molembais (Molenbeque, Molambyes, Molenbaiz), Morns, de, ii. 417, 542. See also Tourcoing, Sieur de. Molesey (Mulsey), Surr., i. p. 679. Molesey, East- (Est Mulsey), Surr., i. p. 679. Molfete, prince of. See Gonzaga, Don F.
Mollington (Molington), Ghesh., i. g. 465 (59). Mollington (Molington), Oxon. and Warw., i. g. 1081 (30). Molon, Dr., letter from, i. 1003. Molsbye alias Molesby, Yorks., nunnery (supp. ), ii. g. 910 (2). Molte, Wm., ii. g. 1068 (46). Molton, Cecilia, i. g. 1335 (55). -, John, i. g. 1335 (55). Molyneux (Molynauxe), Edm., King's Serjeant at law, one of the Council in the North, i. 116:i. g. 622 (pp. 3123, 3189), 623 (pp.31921, 323, 385). -, (Molinex), Hen., i. g. 1335 (50). -, (Molynos), Ric., i. g. 465 (63); ii. 1067 (44). -, (Mollynex), Robt., i. g. 465 (49). -, Sir Wm., ii. 1067 (44). Molyngbeys (i.e. Molembais), Monsr. See Tourcoing, Sieur de. 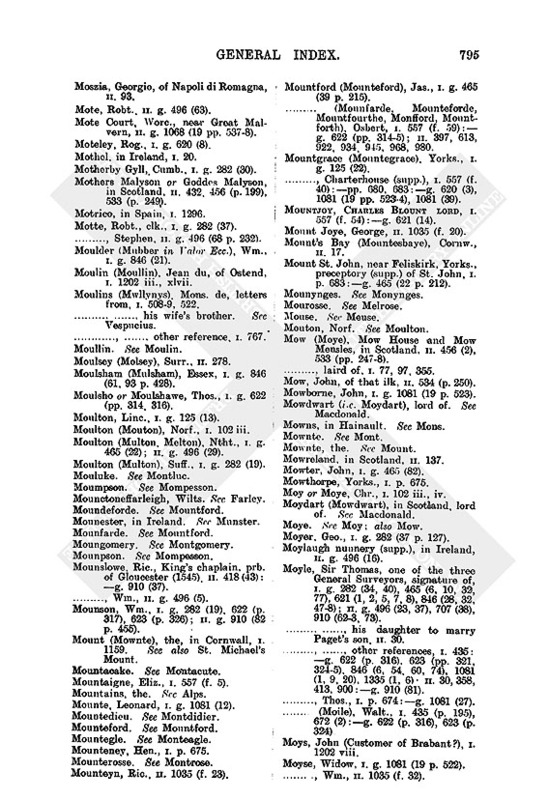 Mompesson (Moumpson, Mounpson), Edm., i. g. 622 (pp. 314, 316). -, Thos., ii. 5767 581. -, -, letters from, ii. 5767. Monastic lands, ii. 733 (p. 344). Monceaulx, Philibert de, medicus, i. g. 282 (31). Moncreiffe (Moncrife), near Perth, laird of, Scottish prisoner, i. 210 (p. 92). -, -, his son, i. 210 (p. 92). Mondye or Mondy, Ralph, ii. 1035 (f. 19). -, (Mundy), Ric., i. g. 1335 (51). -, (Monday, Mondey), Vincent, i. 1182; ii. 267, 610, 864, 878, 922, 978, 996. Mone, Ric., i. g. 465 (65). Moneda, Zuan de or della, captain of the boats of Venice, ii. 78, 103. Mongeham, Kent, i. g. 622 (p. 315). Mongey, Ric., i. g. 465 (101). Mongombray, Mongomerye or Mongommere. See Lorges. Moniz, Theotonius, a Portuguese, ii. 378, 442, 459, 487. Monk Bretton, Yorks., i. g. 465 (39 p. 215). -, priory (supp. ), i. pp. 680 bis, 683:g. 465 (39 pp. 2156, 55). Monkeaton or Monketon, Yorks., i. g. 465 (39). Monkes, Yorks., i. g. 125 (12), 1081 (50). Monkemore, near Shrewsbury, i. g. 465 (74). Monkey, Wm., ii. g. 1068 (46). -, Thos., i. g. 465 (18). Monk Hall or Priors Muck Hall or Muckhall, Salop, ii. g. 496 (34). Monk Soham, Suff. See Soham Monachorum. Monks Kirby (Kirkby Monachorum), Warw., i. g. 1335 (39). Monkton (Monckton), Devon, i. 923. 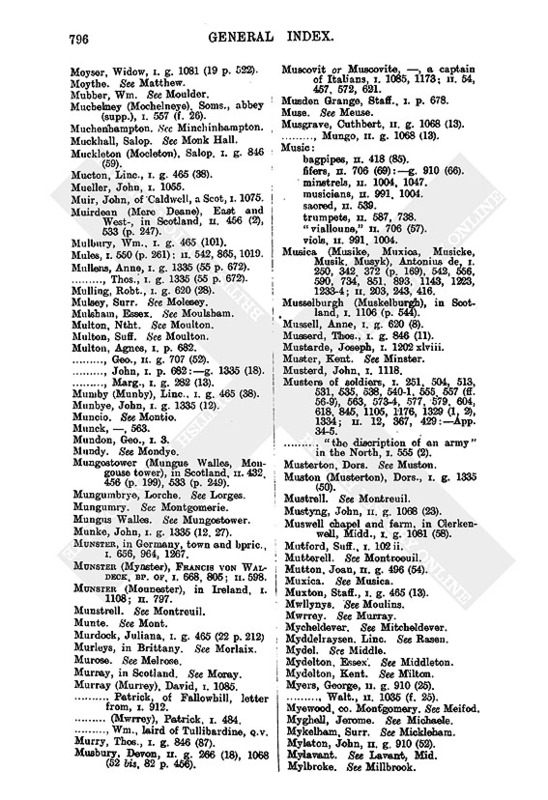 Monkton (Monckton, Monketon), Dham., i. g. 125 (23). Monkton, Wilts. See Winterbourne, Monkton. Monkton, West-, Soms., i. g. 46o (21). Monkton (Monckton), John, ii. g. 266 (35). -, (Monketon), Wm., i,. g. 623 (p. 324), 846 (44): ii. g. 266 (35). Monmouth (Monmowithe), i. g. 1335 (36). -, castle, i. g. 622 (p. 3123), 623 (p. 31920). -, priory (supp. ), i. 557 (f. 39). Monmouth, Anne, i. g. 620 (8). -, (Monmothe), Joan, i. g. 282 (19), 620 (8). -, (Monmothe), Ric., i. g. 282 (19). -, Robt., i. g. 620 (8). -, Wm., i. g. 620 (8). -, commission of the peace, i. g. (p. 319). -, sheriff (15456). See Kemys, J. H.
Monnington, Marg., i. 557 (f. 6). -, (Monyngton), Thos., i. g. 622 (p. 317). Mons (Mowns), in Haiuault, ii. 617. Mont (Mount, Mownt, Munte, Mounte), Christopher, a German in Henry VIII. 's service, letters from, i. 289 80, 212, 350, 4867, 551, 6679, 6778, 735, 80810, 870, 919, 965, 967, 9901, 10478, 10923, 11356, 1205, 1207, 1227, 1229, 1250, 1257; ii. 46, 48, 123, 310, 381, 3845, 5289, 6289, 6723. 7278, 7778, 983, 10634. -, -, letters to, i. 905, 1138, 1170, 1262; ii. 239, 736. -, -, handwriting of, i. 486 (2, 3), 919 (2), 1136, 1138, 1205 (5), 1229 (2); ii. 833 914. -, -, instructions for, i. 901. -, -, other references, i. 67, 8991, 173, 1834, 322, 351, 679, 920, 966, 983 (p. 477), 1001, 1013, 1015, 1046, 1053, 1064, 1086 (p. 535), 1137, 1203 (p. 597), 1204, 1205 (4), 1206, 1225, 1228, 1241; ii. 122, 438, 467, 550, 565, 992, 1035 (f. 20). 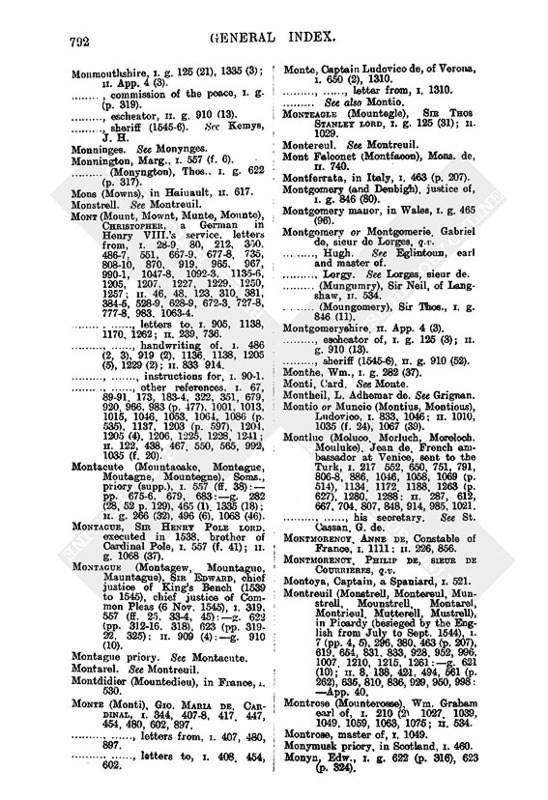 Montacute (Mountacake, Montague, Moutagne, Mountegne), Soms., priory (supp. ), i. 557 (ff. 38):pp. 6756, 679, 683:g. 282 (28, 52 p. 129), 465 (1) 1335 (18); ii. g. 266 (32), 496 (6), 1068 (46). Montague, Sir Henry Pole lord, executed in 1538, brother of Cardinal Pole, i. 557 (f. 41); ii. g. 1068 (37). Montague (Montagew, Mountague, Mauntague), Sir Edward, chief justice of King's Bench (1530 to 1545), chief justice of Common Pleas (6 Nov. 1545), i. 319, 557 (ff. 25, 334, 45):g. 622 (pp. 31216, 318), 623 (pp. 319 22, 325); ii. 909 (4):g. 910 (10). Montdidier (Mountedieu), in France, i. 530. Monte (Monti), Gio. Maria de, Cardinal, i. 344, 4078, 417, 447, 454, 480, 602, 897. -, -, letters from, i. 407, 480, 897. -, -, letters to, i. 408, 454, 602. Monte, Captain Ludovico de, of Verona, i. 650 (2), 1310. -, -, letter from, i. 1310. Monteagle (Mountegle), Sir Thos Stanley lord, i. g. 125 (31); ii.1029. Mont Falconet (Montfacon), Mons. de, ii. 740. Montferrata, in Italy, i. 463 (p. 207). Montgomery (and Denbigh), justice of, i. g. 846 (80). Montgomery manor, in Wales, i. g. 465 (96). Montgomery or Montgomerie. Gabriel de, sieur de Lorges, q.v. -, Hugh. See Eglinitoun, earl and master of. -, Lorgy. See Lorges, sieur de. -, (Mungumry), Sir Neil, of Langshaw, ii. 534. -, (Moungomery), Sir Thos., i. g. 846 (11). Montgomeryshire, ii. App. 4 (3). -, escheator of, i. g. 125 (3); ii. g. 910 (13). Monthe, Wm., i. g. 282 (37). Montheil, L. Adhemar de. See Grignan. Montio or Muncio (Montius, Montious), Ludovico, i. 833, 1046; ii. 1010, 1035 (f. 24), 1067 (39). Montluc (Moluco, Morluch, Moreloch. Mouluke), Jean de, French ambassador at Venice, sent to the Turk, i. 217 552, 650, 751, 791, 8068, 886, 1046, 1058, 1069 (p. 514), 1134, 1172 1188, 1263 (p. 627), 1280, 1288: ii. 287, 612, 667, 704, 807, 848, 914, 985, 1021. -, -, his secretary. See St. Gassan. G. de. Montmorency Anne de, Constable of France, i. 1111; ii. 226, 856. Montmorency, Philip de, sieur de courrieres, q.v. Montoya, Captain, a Spaniard, i. 521. Montreuil (Monstrell, Montereul, Munstrell, Mounstrell, Montarel, Montrieul. Mutterell, Mustrell), in Picardy (besieged by the English from July to Sept. 1544), i. 7 (pp. 4, 5), 296, 380, 463 (p. 207), 619, 654, 831, 833, 928, 952, 996, 1007, 1210, 1215, 1261:g. 621 (10);' ii. 8, 138, 421, 494, 561 (p. 262), 635, 810, 836, 920, 960, 998:App. 40. Montrose (Mounterosse), Wm. Graham earl of, i. 210 (2) 1027 1039, 1049, 1059, 1063, 1075; ii. 534. Montrose, master of, i. 1049. Monymusk priory, in Scotland, i. 460. Monyn. Edw., i. g. 622 (p. 316), 623 (p. 324). Monynges (Monninges, Mounynges), Edw., 1.672 (2); ii. g . 910 (3). -, (Monninges), Ric., i. 672 (2). Mooll, John, i. g. 1081 (19). Moor (le More), alias Ashamstead, Bucks (near Great Marlow, but part of Lewknor parish), ii. g. 266(5). Moore House (Morehowse), Salop, ii. g. 496 (34). Moor Hall (Morehall), Essex, i. g. 282 (20). Moor Park, or the More, Herts, i. p. 674; ii. 1035 (f. 19). -, treaty of (30 Aug. 1525), ii. 880. Moors, in the French galleys, i. 983. Moorsholme (Moresome), Yorks., i. g. 465(39). Moose, John, i. g. 1335 (12). Mora, de, a captain of Spaniards, i. 521. Morall, Hants, ii. g. 266 (33). Morall, Nic., i. g. 621 (12 p. 308). Moran, i. 1046 (2). i.e. Norham. Moraunte, John, ii. 1035 (f. 26). -, (Morant), Ric., ii. 1035 (f. 28). -, Wm., i. 557 (f. 30). Moray (Murray) in Scotland, bp. of, ii. 534. -, chancellor of. 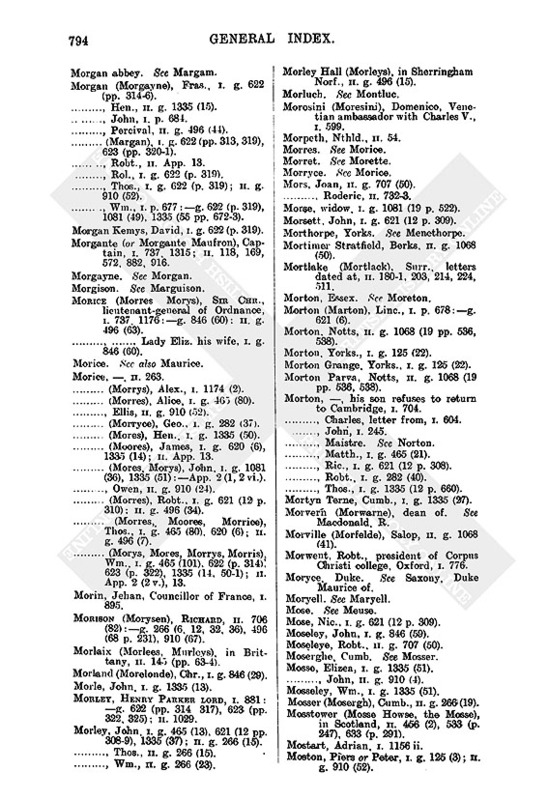 See Thornton, J.
Moray (Murray), Elizabeth countess of, i. 875. Morbattle (Marbottell), in Scotland, ii. 456 (2), 533 (p. 247). Morborn (Morburne), Hunts, i. g. 1081 (58). Mordaunt (Mordaunce), John lord, i. g. 622 (pp. 3123, 3156, 318), 623 (pp. 3202, 324); ii. 1029:g. 910 (4), 1068 (46). -, Sir John, i. g. 623 (p. 322); ii. g. 707 (10). -, (Mordaunce), Robt., i. g. 622 (p. 312), 623 (pp. 3202). More, the. See Moor Park. More, Mr., i. 1329 (2). -, (Moore), Sir Chr., King's remembrancer of the Exchequer, i. 85:g. 282 (6), 622 (pp. 3123, 315, 319), 623 (pp. 3201, 323, 325), 846 (1, 56); ii. g. 707 (40), 910 (67, 74), 1068 (11, 25). -, Edw., ii. g. 496 (34). -, Henry, abbot of Tower Hill, London, i. 557 (f. 17). -, Henry, ii. g. 266 (35). -, Hugh, ii. g. 1068 (45). -, John, abbot of Thornton Curtis, i. 557 (f. 73). -, (Moore), John, i. p. 676 bis:g. 282 (25), 1081 (24); ii. 418 (15), 645, 706 (24), 814, 1035 (f. 30):g. 496(21). 910 (59):App. 2 (2 vi.). -, Marg., i. 557 (f. 69). -, (Moore), Matthew, of the Steelyard, ii. 538. -, Robt., i. g. 1335 (51); ii. g. 266 (35). -, Rog., i. 557 (f. 59):g. 622 (p. 319), 623 (p. 323). -, Sir Thomas (executed in 1535), i. g. 846 (61, 93 p. 428); ii. g. 266(5). -, Thos., i. g. 1081 (52), 1335 (34, 36). -, (Moore), Wm., i. 1281:g. 1335(51, 55, 672); ii. g. 1068 (19 p. 536). Morehall, Essex. See Moor Hall. Morehowse, Salop. See Moore House. Morengettam parish, Salop, i. g. 1335 (23). Moreni Captain Bart., of Modena, i. 650 (2); ii. 464. More Place or Mere Place, Heref., i. g. 846 (11). Moresby, Thos., i. p. 679. Moreton, Berks., i. g. 465 (63). Moreton (Morton), Essex i. g. 622 (p. 314). Moreton, North- (Northmorton), Berks, ii. g. 910 (21). Moreton, Ant., ii. g. 496 (49). -, Chr., i. g. 623 (p. 323). -, Marg., ii. 1035 (f. 22). -, Rol., i. g. 622 (pp. 3134, 317), 623 (pp. 3202); ii. App. 15. -, Thos., i. g. 465(42), 622 (p. 316), 623 (p. 322). 846 (87). -, Wm.. i. 538 (p. 255):g. 622 (p. 316). Morette (Moret, Morret, Morrett), sieur de, French ambassador with Charles V., i. 70 (p. 32), 217, 229 (p. 100), 254. 281 (p. 121), 290, 303, 332, 342, 372, 403, 406, 425 (pp. 1879), 457, 461, 4734, 503, 542, 570, 587, 689, 861, 1242; ii. 352, 541, 941 (p. 470). -, -, his secretary, i. 457. Morfyn, Wm., i. g. 620 (44). Morgan (Morgayne), Fras., I. g. 622 (pp. 3146). -, Hen., ii. g. 1335 (15). -, John, i. p. 684. -, Percival, ii. g. 496 (44). -, (Margan), i. g. 622 (pp. 313, 319), 623 (pp. 3201). -, Robt., ii. App. 13. -, Rol., i. g. 622 (p. 319). -, Thos., i. g. 622 (p. 319); ii. g. 910 (52). -, Wm., i. p. 677:g. 622 (p. 319), 1081 (49), 1335 (55 pp. 6723). Morgan Kemys, David, i. g. 622 (p. 319). Morgante (or Morgante Maufron), Captain, i. 737, 1315; ii. 118, 169, 572, 882, 916. Morice (Morres Morys), Sir Chr., lieutenant-general of Ordnance, i. 737, 1176:g. 846 (60): ii. g. 496 (63). -, -, Lady Eliz. his wife, i. g. 846 (60). -, (Morrys), Alex., i. 1174 (2). -, (Morres), Alice, i. g. 465 (80). -, Ellis, ii. g. 910 (52). -, (Morryce), Geo., i. g. 282 (37). -, (Mores), Hen., i. g. 1335 (50). -, (Moores), James, i. g. 620 (6), 1335 (14); ii. App. 13. -, (Mores, Morys), John, i. g. 1081 (36), 1335 (51):App. 2 (l, 2vi.). -, Owen, ii. g. 910 (24). -, (Morres), Robt., I. g. 621 (12 p. 310): ii. g. 496 (34). -, (Morres, Moores, Morrice), Thos., i. g. 465 (80). 620 (6); ii. g. 496 (7). -, (Morys, Mores, Morrys, Morris) Wm., i. g. 465 (101), 622 (p. 314), 623 (p. 322), 1335 (14, 501); ii. App. 2 (2 v.), 13. Morin, Jehan, Councillor of France, i. 895. Morison (Morysen), Richard, ii. 706 (82):g. 266 (6, 12, 32, 36), 496 (68 p. 231), 910 (67). Morlaix (Morlees, Murleys), in Brittany, ii. 145 (pp. 634). Morland (Morelonde), Chr., i. g. 846 (29). Morle, John, i. g. 1335 (13). Morley, Henry Parker lord, i. 881:g. 622 (pp. 314 317), 623 (pp. 322, 325); ii. 1029. Morley, John, i. g. 465 (13), 621 (12 pp. 3089), 1335 (37); ii. g. 266 (15). -, Thos., ii. g. 266 (15). -, Wm., ii. g. 266 (23). Morley Hall (Morleys), in Sherringham Norf., ii. g. 496 (15). Morosini (Moresini), Domenico, Venetian ambassador with Charles V., i. 599. Mors, Joan, ii. g. 707 (50). Morse, widow, i. g. 1081 (19 p. 522). Morsett, John, i. g. 621 (12 p. 309). Mortimer Stratfield, Berks, ii. g. 1068 (50). 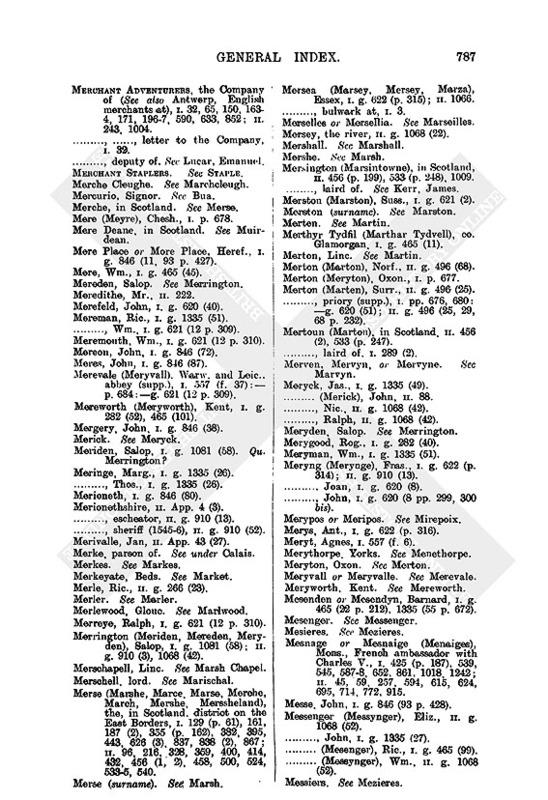 Mortlake (Mortlack), Surr., letters dated at, ii. 1801, 203, 214, 224, 511. Morton (Marion), Linc., i. p. 678:g. 621 (6). Morton, Notts, ii. g. 1068 (19 pp. 536, 538). Morton, Yorks., i. g. 125 (22). Morton Grange. Yorks., i. g. 125 (22). Morton Parva, Notts, ii. g. 1068 (19 pp. 536, 538). Morton, , his son refuses to return to Cambridge, i. 704. -, Charles, letter from, i. 604. -, Matth., i. g. 465 (21). -, Ric., i. g. 621 (12 p. 308). -, Robt., i. g. 282 (40). -, Thos., i. g. 1335 (12 p. 660). Mortyn Terne, Cumb., i. g. 1335 (27). Morvern (Morwarne), dean of. See Macdonald, R.
Morville (Morfelde), Salop, ii. g. 1068 (41). Morwent, Robt., president of Corpus Christi college, Oxford, i. 776. Moryce. Duke. See Saxony, Duke Maurice of. Mose, Nic., i. g. 621 (12 p. 309). Moseley, John, i. g. 846 (59). Moseleye, Robt., ii. g. 707 (50). Mosse, Elizea, i. g. 1335 (51). -, John, ii. g. 910 (4). Mosseley, Wm., i. g. 1335 (51). Mosser (Mosergh), Cumb., ii. g. 266 (19). Mosstower (Mosse Howse, the Mosse), in Scotland, ii. 456 (2), 533 (p. 247), 633 (p. 291). Mostart, Adrian, i. 1156 ii. Moston, Piers or Peter, i. g. 125 (3); ii. g. 910 (52). Moszia, Georgio, of Napoli di Romagna, ii. 93. Mote, Robt., ii. g. 496 (63). Mote Court, Worc., near Great Malvern, ii. g. 1068 (19 pp. 5378). Moteley, Rog., i. g. 620 (8). Mothel. in Ireland, i. 20. Motherby Gyll,Cumb., i. g. 282 (30). Mothers Malyson or Goddes Malyson, in Scotland, ii. 432 456 (p. 199), 533 (p. 249). Motrico, in Spain, i. 1296. Motte, Robt., clk., i. g. 282 (37). -, Stephen, ii. g. 496 (68 p. 232). Moulder (Mubber in Valor Ecc. ), Wm., i. g. 846 (21). Moulin (Moullin), Jean du, of Ostend, i. 1202 iii., xlvii. Moulins (Mwllynys) Mons. de, letters from, i. 5089, 522. -, -, his wife's brother. See Vespucius. -, -, other reference, i. 767. Moulsey (Molsey), Surr., ii. 278. Moulsham (Mulsham), Essex, i. g. 846 (61, 93 p. 428). Moulsho or Moulshawe, Thos., i. g. 622 (pp. 314. 316). Moulton, Linc, i. g. 125 (13). Moulton (Mouton), Norf., i. 102 iii. Moulton (Multon, Melton), Ntht., i. g. 465 (22); ii. g. 496 (29). Moulton (Multon), Suff., i. g. 282 (19). Mounester, in Ireland. See Munster. Mounslowe, Ric., King's chaplain, prb. of Gloucester (1545) ii. 418 (43):g. 910 (37). -, Wm., ii. g. 496 (5). Mounson, Wm., i. g. 282 (19), 622 (p. 317), 623 (p. 326); ii. g. 910 (82 p. 455). Mount (Mownte), the, in Cornwall, i. 1159. See also St. Michael's Mount. Mountaigne, Eliz., i. 557 (f. 5). Mounte, Leonard, i. g. 1081 (12). Mounteney, Hen., i. p. 675. Mounteyn, Ric., ii. 1035 (f. 23). Mountford (Mounteford), Jas., i. g. 465 (39 p. 215). 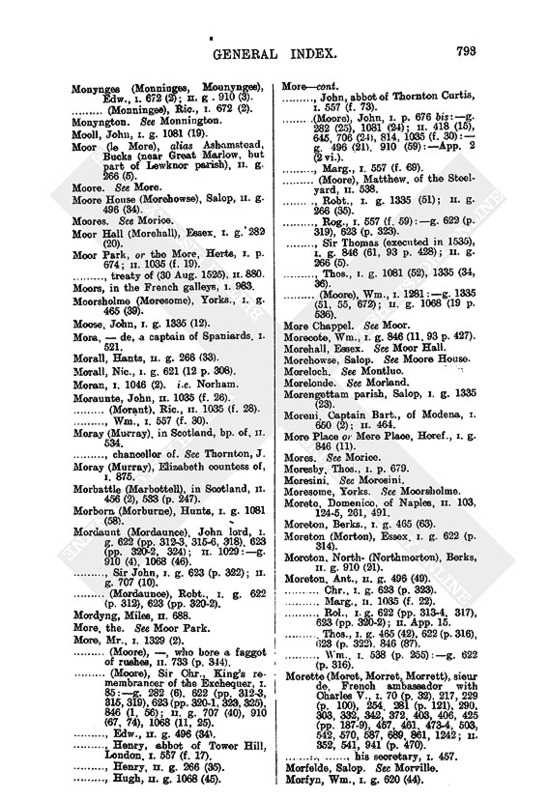 -, (Mounfarde, Mounteforde, Mounitfourthe, Monfford, Mountforth), Osbert, i. 557 (f. 59):g. 622 (pp. 3145); ii. 397, 613, 922, 934, 945, 968, 980. Mountgrace (Mountegrace), Yorks., i. g. 125 (22). -, Charterhouse (supp. ), i. 557 (f. 40):pp. 680, 683:g. 620 (3), 1081 (19 pp. 5234), 1081 (39). Mountjoy, Charles Blount lord, i. 557 (f. 54):g. 621 (14). Mount Joye, George, ii. 1035 (f. 20). Mount's Bay (Mountesbaye), Cornw., ii. 17. Mount St. John, near Feliskirk, Yorks., preceptory (supp.) of St. John, i. p. 683:g. 465 (22 p. 212). Mow (Moye), Mow House and Mow Mensles, in Scotland, ii. 456 (2), 533 (pp. 2478). -, laird of, i. 77, 97, 355. Mow, John, of that ilk, ii. 534 (p. 250). Mowborne, John, i. g. 1081 (19 p. 523). Mowdwart (i.e. Moydart), lord of. See Macdonald. Mowns, in Hainault. See Mons. Mowreland, in Scotland, ii. 137. Mowter, John, i. g. 465 (82). Mowthorpe, Yorks., i. p. 675. Moy or Moye, Chr., i. 102 iii., iv. Moydart (Mowdwart), in Scotland, lord of. See Macdonald. Moye. See Moy; also Mow. Moyer, Geo., i. g. 282 (37 p. 127). Moylaugh nunnery (supp. ), in Ireland, ii. g. 496 (16). Moyle, Sir Thomas, one of the three General Surveyors, signature of, i. g. 282 (34, 40), 465 (6, 10, 32, 77), 621 (1, 2, 5, 7, 8), 846 (28, 32, 478); ii. g. 496 (23, 37), 707 (38), 910 (623, 73). -, -, his daughter to marry Paget's son, ii. 30. -, -, other references, i. 436:g. 622 (p. 316), 623 (pp. 321, 3245), 846 (6, 54, 60, 74), 1081 (1, 9, 20), 1335 (1, 6) ii. 30, 358, 413, 900:g. 910 (81). -, Thos., i. p. 674:g. 1081 (27). Moys, John (Customer of Brabant? ), i. 1202 viii. Moyse, Widow, i. g. 1081 (19 p. 522). -, Wm., ii. 1035 (f. 32). Moyser, Widow, i. g. 1081 (19 p. 522). Muchelmey (Mochelneye), Soms., abbey (supp. ), i. 557 (f. 26). Muckhall, Salop. See Monk Hall. Muckleton (Mocleton), Salop, i. g. 846 (59). Mucton, Linc., i. g. 465 (38). Muir, John, of Caldwell, a Scot, i. 1075. Muirdean (Mere Deane), East and West-, in Scotland, ii. 456 (2), 533 (p. 247). Mulbury, Wm., i. g. 465 (101). Mules, i. 550 (p. 261); ii. 542, 865,1019. Mullens, Anne, i. g. 1335 (55 p. 672). -, Thos., i. g. 1335 (55 p. 672). Mulling, Robt., i. g. 620 (28). Multon, Agnes, i. p. 682. -, Geo., ii. g. 707 (52). -, John, i. p. 682:g. 1335 (18). -, Marg., i. g. 282 (13). Mumby (Munby), Linc., i. g. 465 (38). Munbye, John, i. g. 1335 (12). Mungostower (Mungus Walles, Mongouse tower), in Scotland, ii. 432, 456 (p. 199), 533 (p. 249). Munke, John, i. g. 1335 (12, 27). Munster, in Germany, town and bpric., i. 656, 964, 1267. Munster, (Myneter), Francis von Waldeck, bp. of, i. 668, 805; ii. 598. Munster (Mounester), in Ireland, i. 1108; ii. 797. Murleys, in Brittany. See Morlaix. Murray, in Scotland. See Moray. Murray (Murrey), David, i. 1085. -, Patrick, of Fallowhill, letter from, i. 912. -, (Mwrrey), Patrick, i. 484. -, Wm., laird of Tullibardine, q.v. Murry, Thos., i. g. 846 (87). Musbury, Devon, ii. g. 266 (18), 1068 (52 bis, 82 p. 456). Muscovit or Muscovite, , a captain of Italians, i. 1085, 1173; ii. 54, 457, 572, 621. Musden Grange, Staff., i. p. 678. Musgrave, Cuthbert, ii. g. 1068 (13). -, Mungo, ii. g. 1068 (13). fifers, ii. 706 (69):g. 910 (66). Musica (Musike, Muxica, Musicke, Musik, Musyk), Antonius de, i. 250, 342 372 (p. 169), 542, 556, 590, 734, 851, 893, 1143, 1223, 12334; ii. 203, 243, 416. Musselburgh (Muskelburgh), in Scotland, i. 1106 (p. 544). Mussell, Anne, i. g. 620 (8). Musserd, Thos., i. g. 846 (11). Mustarde, Joseph, i. 1202 xlviii. Musters of soldiers, I. 251, 504, 513, 531, 535, 538, 5401, 555, 557 (ff. 569), 563, 5734, 577, 579, 604, 618, 845, 1105, 1176, 1329 (1, 2), 1334; ii. 12, 367, 429:App. 345. -, "the discription of an army" in the North, i. 555 (2). Muston (Musterton), Dors., i. g. 1335 (50). Mustyng, John, ii. g. 1068 (23). Muswell chapel and farm, in Clerkenwell, Midd., i. g. 1081 (58). Mutford, Suff., i. 102 ii. Mutton, Joan, ii. g. 496 (54). Muxton, Staff., i. g. 465 (13). Myers, George, ii. g. 910 (25). -, Walt., ii. 1035 (f. 25). Myewood, co. Montgomery. See Meifod. Mylaton, John, ii. g. 910 (52). Myles, Thos., i. p. 674. Mylstanes, in Scotland. See Mellerstone. Mylys, Hen., i. g. 846 (87). Mymburye chapel, Wilts., ii. 850 (6). Mymme, Hen., i. p. 680. Mynar, Mr., draper, ii. App. 43 (30). Myncke, bpric. of, in Germany, ii. 602. Mynet or Mynett, Soms. See Minehead. Mynet, Wm., i. g. 620 (8 p. 300). Mynforde, Ric., i. g. 622 (p. 317). Mynkys, Thos., i. g. 1335 (55 p. 672). Mynne, John, i. g. 282 (18); ii. g. 1068 (3). -, Matth., ii. g. 707 (50). -, Nich., auditor of the King's mints, i. g. 620 (26). 1081 (26); ii. App. 13. Mynoryes, The. See under London. 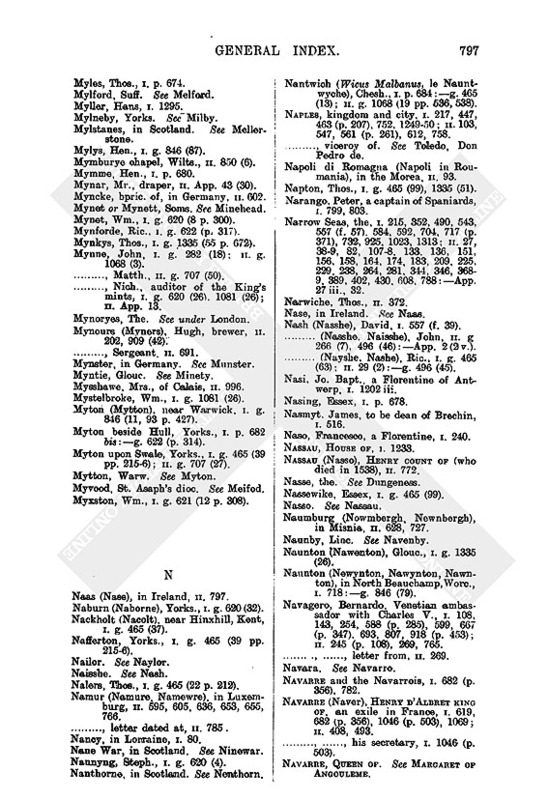 Mynours (Myners), Hugh, brewer, ii. 202, 909 (42). Mynster, in Germany. See Munster. Mysshawe, Mrs., of Calais, ii. 996. Mystelbroke, Wm., i. g. 1081 (26). Myton (Mytton), near Warwick, i. g. 846 (11, 93 p. 427). Myton beside Hull, Yorks., i. p. 682 bis:g. 622 (p. 314). Myton upon Swale, Yorks., i. g. 465 (39 pp. 2156); ii. g. 707 (27). Myvood, St. Asaph's dioc. See Meifod. Myxston, Wm., i. g. 621 (12 p. 308).